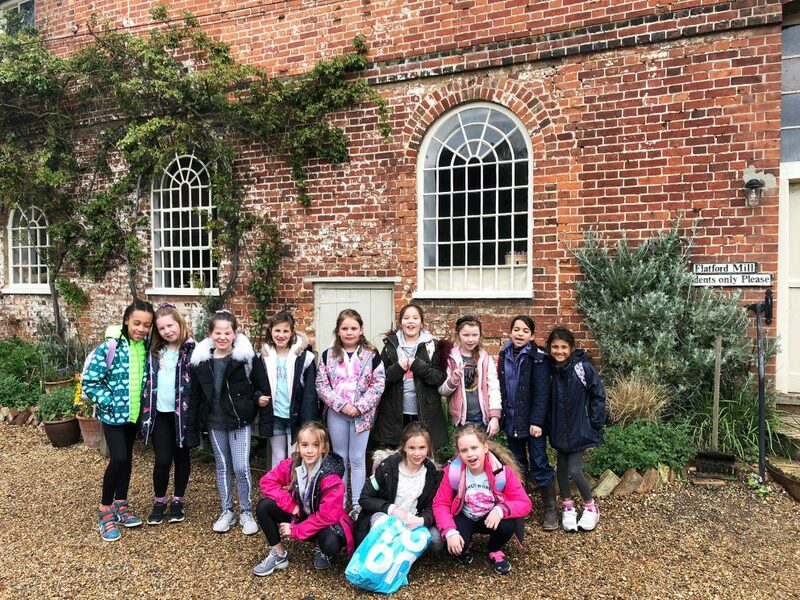 Year 4 and 5 had a brilliant time on their trip to Ufton Court. Tudors. Year 4 studied Tudor artefacts and portraits, and then made their own quill and ink for writing, whilst Year 5 learnt how to battle and sail as a Viking and then created their own torcs. What an exciting trip! You can see lots more photos of the trip on our Facebook page. 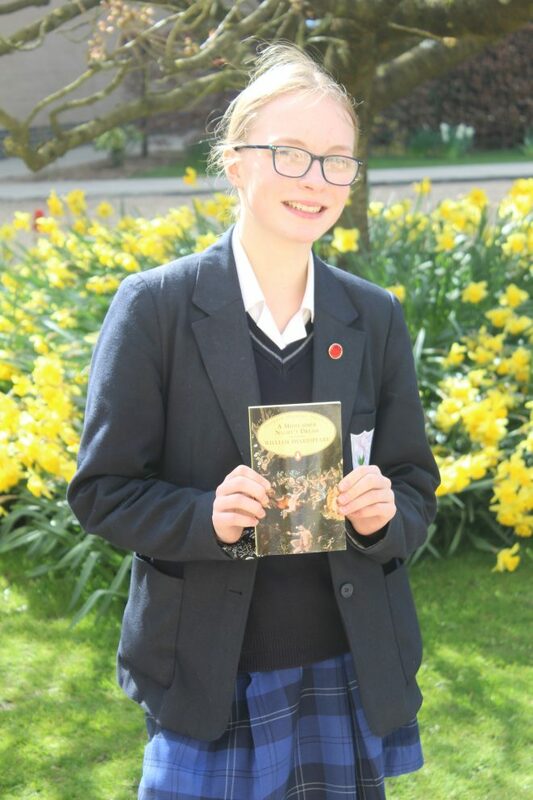 Huge congratulations to Emily, who entered the Independent School’s Association Shakespeare Monologue Competition with her LAMDA examination piece. 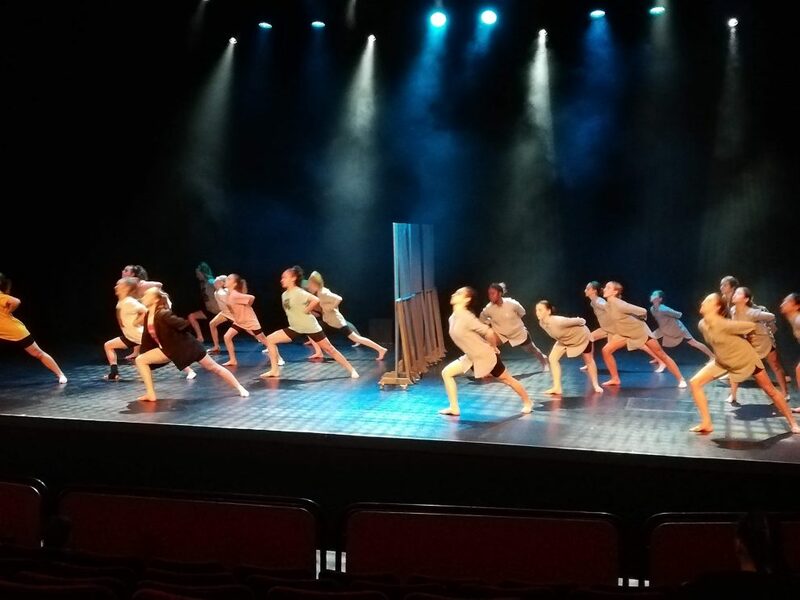 On 25th March 24 girls from Years 7 to 13 took part in the Stevenage Rock Challenge Dance competition. achievement in a variety of areas. These awards included Student Leadership, Choreography, Visual Design and Concept. Judges complemented us on the high technical ability of our students and their use of lighting and sound to enhance the performance. A teacher from another competing school commented that our piece was “the best she had seen in 13 years of competing at Rock Challenge.” We are extremely proud of all of the girls who were involved and we now have our fingers crossed that we received enough points to go through to the Regional Finals. Well done, girls! On Monday, St Mary's hosted a Public Speaking Event. There were five teams in total with two teams per school. We welcomed Gayhurst, Thorpe House, Chalfont St Peter Academy and Chesham Prep School. delivery was high with all teams presenting themselves well. We were very fortunate to have Ann Hall and Tony Aston come and judge our event. Tony and Ann are from the local community and work closely with the Rotary club. They have previously been judges for the Rotary Youth Speaks so were very qualified in their judging abilities. 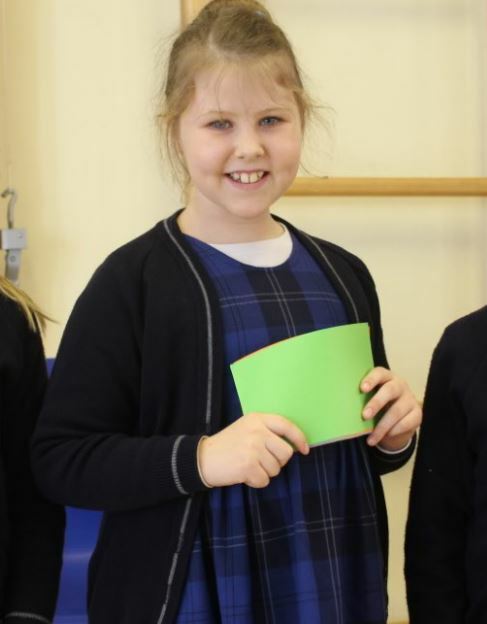 Congratulations to Eliza from Year 4 who won Best Overall Speaker out of all 30 children! which look fantastic. Year 4 designed pop-up books, including different moving parts and mechanisms to retell traditional tales. Their designs were very unique and creative and they should all be extremely proud of their hard work. This week the four Houses have been hard at work raising money for their chosen charities. children in education. The Sixth Formers have put on wonderful and entertaining assemblies, that have also been poignant and clearly stated the aims of the charities they’re supporting. They have also held sales each break-time of cakes and biscuits, and also chicken nuggets, chips and mozzarella sticks! 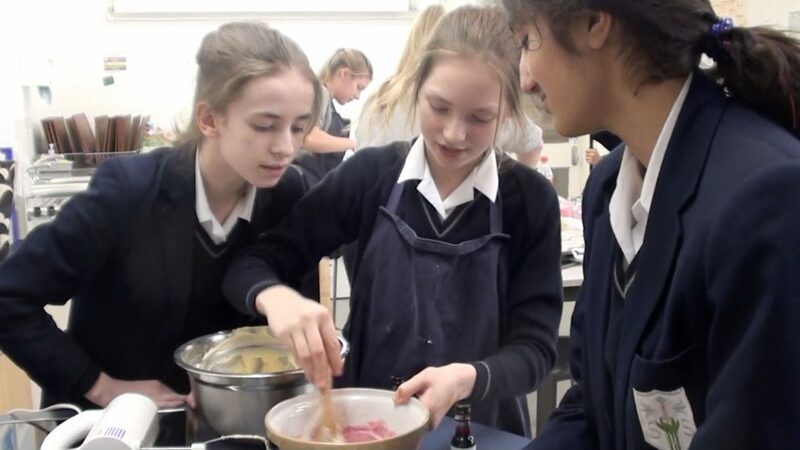 The final day of Charities Week focussed on the Prep Department, and girls came to school in Mufti, purchased goodies at break-time and took part in a huge array of activities at lunch-time – look out for pictures of Friday’s fun in next week’s newsletter! Yet more amazing Gymnastics from our talented girls. High, and many others. All of the gymnasts performed very well, and the amazing St Mary’s Under 11 team were named champions! The team will now compete and represent the South in the National Floor and Vault Finals in May, in Stoke on Trent. Congratulations, girls, on another incredible victory. 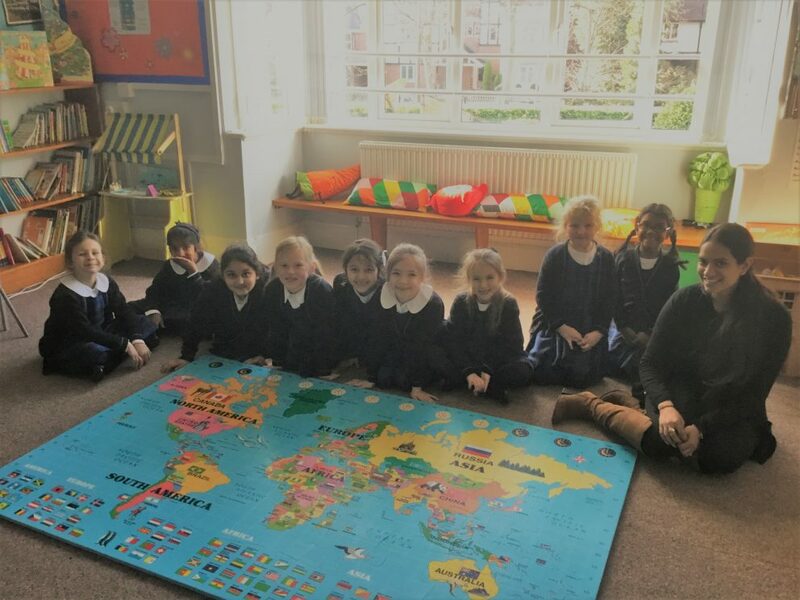 Year 4 have been learning about the global issue of plastic pollution in our oceans, and the associated risks and problems that come with it. to help save our planet, they have been creating innovations to helping either prevent or reduce the problem. We can’t wait to see their final designs! To follow on from the Year 12 visit to Westminster last Monday, this week has been a celebration of Parliament at St Mary’s. The focus this year was the ability to hold dissenting opinions within our UK pluralist democracy. supporTo follow on from the Year 12 visit to Westminster last Monday, this week has been a celebration of Parliament at St Mary’s. The focus this year was the ability to hold dissenting opinions within our UK pluralist democracy. The students started by looking at examples of secret protest from the recent “I Object” exhibition at the British museum. They looked at objects that contained hidden political messages and learned how people living under tyranny have found creative ways to make their voices heard. Tutor groups then discussed how fortunate we are to be able to express our opinions freely and without fear of arrest. Our Sixth Form students continued this theme by partaking in our very own assembly edition of “Question Time”, discussing whether the government should lower the voting age, and the topical issue of a ‘people’s vote’! There has also been a wide range of political messages hidden around the school this week for pupils to find. Everything from songs with political undertones, an environmental colour theme amongst the staff and logos from various protest groups have been deployed around the school to help our St Mary’s girls raise their own political awareness and find causes of their own to support. Last Friday the Sixth Form girls were visited by student run company called Strength From Within (SFW), to speak to them about what to expect from University, and how to cope with the last few months of Sixth Form. Last Friday the Sixth Form girls were visited by student run company called Strength From Within (SFW), to speak to them about what to expect from University, and how to cope with the last few months of Sixth Form. It was an interactive and engaging session, where students were in control of the topics that were discussed as they voted yes or no to suggestions. There were two final year university students who shared their Sixth form experiences, and how they went about applying for University and coping with the first few years there. They then spoke about ‘life after school’ and the expectations, and how to deal with them from a student’s perspective. It was most interesting to hear our Sixth Form students get fully engaged in the discussion, and to interact with each other, voicing their different opinions. We are grateful for SFW for taking the time to speak to our students. ast Friday the Sixth Form girls were visited by student run company called Strength From Within (SFW), to speak to them about what to expect from University, and how to cope with the last few months of Sixth Form. It was an interactive and engaging session, where students were in control of the topics that were discussed as they voted yes or no to suggestions. There were two final year university students who shared their Sixth form experiences, and how they went about applying for University and coping with the first few years there. They then spoke about ‘life after school’ and the expectations, and how to deal with them from a student’s perspective. It was most interesting to hear our Sixth Form students get fully engaged in the discussion, and to interact with each other, voicing their different opinions. We are grateful for SFW for taking the time to speak to our students. 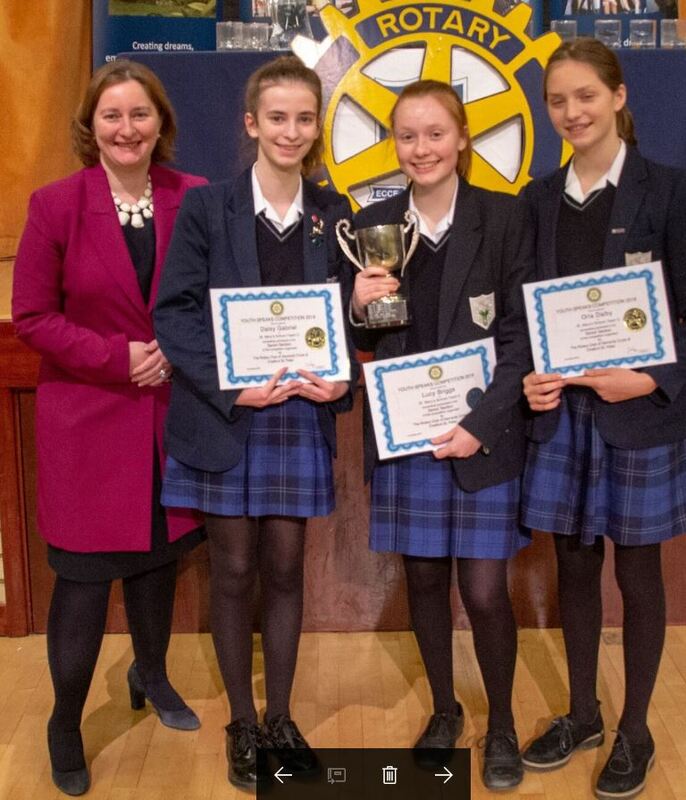 Congratulations to our Year 10 public speaking team; Daisy, Lucy and Orla, who qualified for the Zone Final of the Rotary Club Youth Speaks Competition last Friday, 18th January. St Mary's was proud to host the local heat of the 2018/19 Competition. 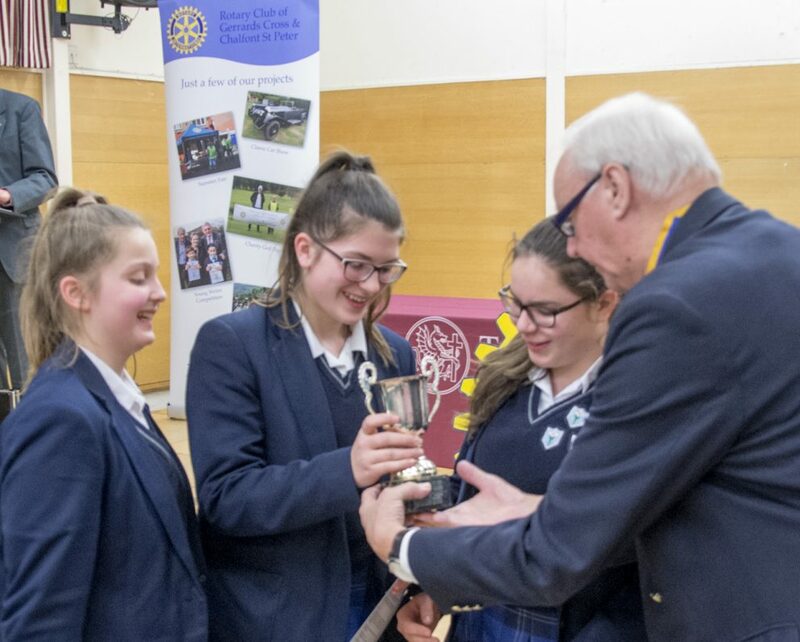 competitors,Congratulations to our Year 10 public speaking team; Daisy, Lucy and Orla, who qualified for the Zone Final of the Rotary Club Youth Speaks Competition last Friday, 18th January. St Mary’s was proud to host the local heat of the 2018/19 Competition. Six teams from St Mary’s and Thorpe House School delivered excellent presentations on a range of topics from ‘Here to stay or throw it away’, from Year 9s Polly, Jaskiran and Madison in the Intermediate Section, to ‘It’s a conspiracy’. The judges remarked on the extremely high standard of the entrants, with Isabelle, Year 12, earning the accolade as ‘next Prime Minister’ after her convincing speech on ‘Should the vote be extended to 16-year-olds?’, backed by her Year 12 team-mates Alexandra and Dayna. Our other Year 12 team both challenged and entertained us with Millie’s powerful presentation on ‘Are our thoughts our own?’ supported by Krupa and Avneet. Well done to all the competitors. Although Michaelmas term ended on Thursday 13th December, St Mary's School was very much alive and kicking on Friday 14th December, as we were joined by several schools in the area for the BSGA Southern Region Milano Trio Gymnastics Competition. day.Although Michaelmas term ended on Thursday 13th December, the school was very much alive and kicking on Friday 14th December, as we were joined by several schools in the area for the BSGA Southern Region Milano Trio Gymnastics Competition. It was a fantastic day of gymnastics and our teams did amazingly well. The Under 16 team finished in 2nd place, and the Under 11 girls finished in first place! Both teams will be representing the school in the nationals in March. Our Under 13 team then finished in 3rd place. A great achievement for all the girls and their coaches. Special thanks go to Mrs Deadman for organising the day, Miss Connell for helping prepare the teams, and to Mrs Hemsworth for helping on the day. Wednesday was the final of House Bake Off 2018. Six girls advanced through to this round and the challenge of creating a Showstopper cake. Mrs Adams, Mrs Kingston and Mr Moss as our judges this week and their jaws dropped when they saw the amazing creations of our skilled bakers. All three judges commented on the skill, creativity and ability of each cake and judging was incredibly close. Mrs Adams commented that it was her hardest decision to date, as Head! Congratulations to our Star Baker Lisa for her Lemon and Blueberry Showstopper with handmade meringues and chocolate shards. 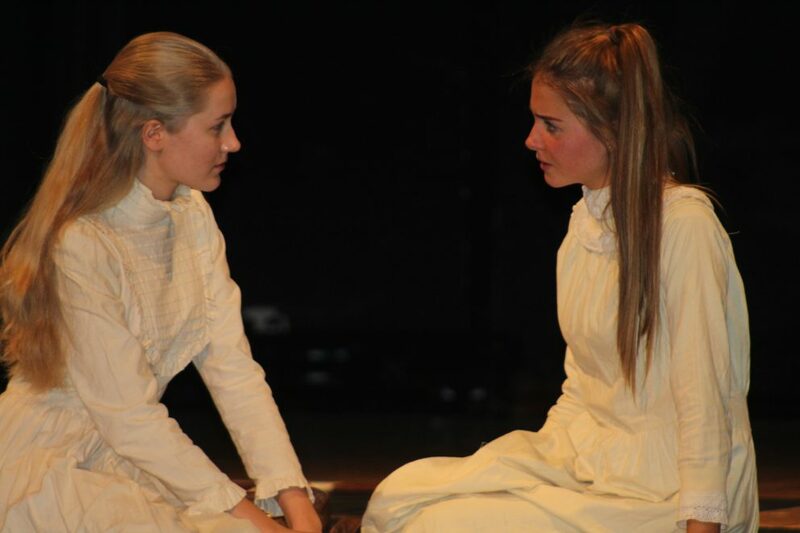 Last Thursday and Friday saw performances of the Senior House production; The Light Burns Blue. story follows the girls as they are catapulted to the heights of fame; their photographs published around the world. However, will the girls be exposed as fakes? Congratulations to Mrs Kalinowski and all the girls who performed on a fantastic production. The girls in EYFS had an amazing afternoon at Thorpe House on Friday. and how to stay safe around a fire. They then cooked popcorn, made crowns and finished the day with a nice hot chocolate! Thanks to the Thorpe explorers for being such lovely hosts. On Tuesday 20th November, Chamber Choir sang at Marlow Music Festival. Two years ago, the Senior Choir entered this competition and gained a bronze medal, so hopes were high that we would match this achievement, if not surpass it! On Tuesday 20th November, Chamber Choir sang at Marlow Music Festival. Two years ago, the Senior Choir entered this competition and gained a bronze medal, so hopes were high that we would match this achievement, if not surpass it! 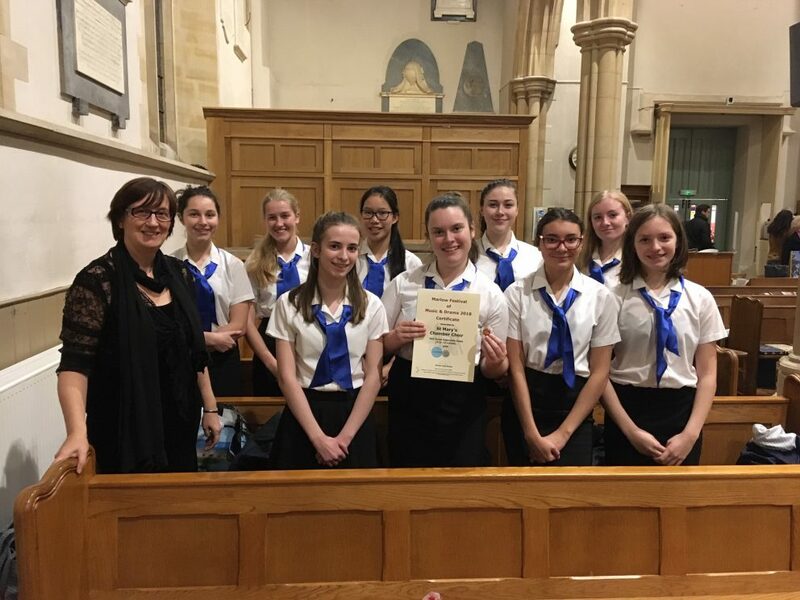 The nine members of Chamber Choir – Jazmin, Phillipa, Olivia, Maisie, Kate, Grace, Orla, Daisy and Daniella sang two songs, ‘Flanders Fields’ and ‘Electricity’ from Billy Elliot. They sang beautifully and Mrs Phillips was very proud of their performance. The adjudicator complemented the girls on their warm tone quality, part-singing and solos. 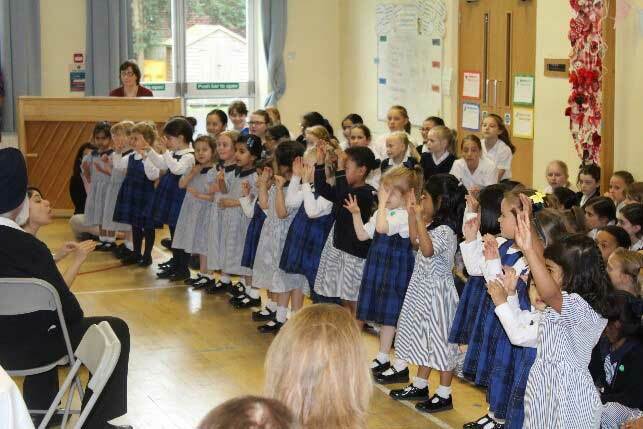 She also pointed out that the girls seemed to have a real sense of ‘camaraderie and enjoyment of singing together’. We all really enjoyed the experience and were pleased to come away with a silver medal! Well done, girls – a superb performance! On Thursday 14th November, Miss Wilkins accompanied eight girls to Milton Keynes, to play in the ISA Badminton, London North Region Tournament. Badminton Centre- and they lost that match. The Year 9 team carried on winning all day, dropping few points throughout the games. The Year 10 Badminton team, consisting of Cara, Anna, Lia and Abbie subsequently came in a brilliant 2nd place. The Year 9 team went on to win the tournament! Huge congratulations to Alisha, Lucy, Holly and Jaskiran. Both teams have qualified for Nationals! Well done, girls! 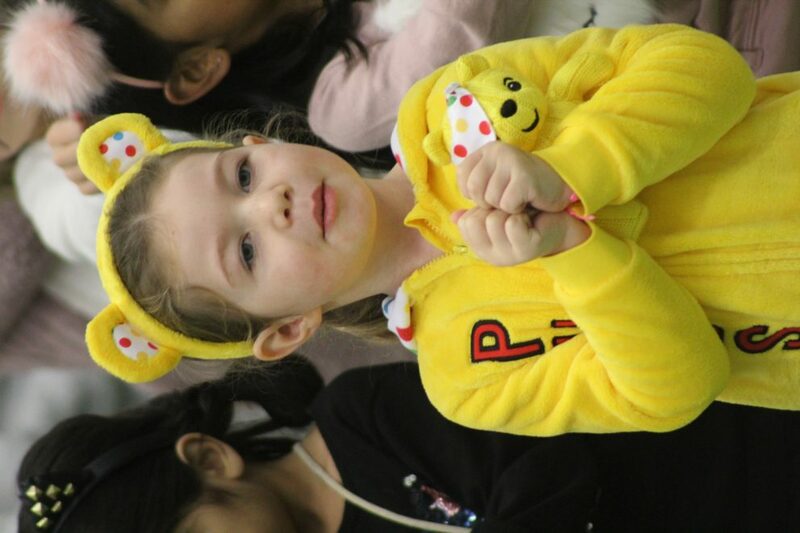 Last Friday was Children in Need, which meant a day of fun and fundraising! Girls (and teachers!) across the school came dressed in mufti, with plenty of animal onesies and face paint on show! donut hanging from a string faster; student or teacher? Of course no whole school assembly is complete without a school hymn, and what better school hymn than… Baby Shark! (doo doo doo doo doo doo) Break time brought cake sales in both Prep and Senior House, yum! 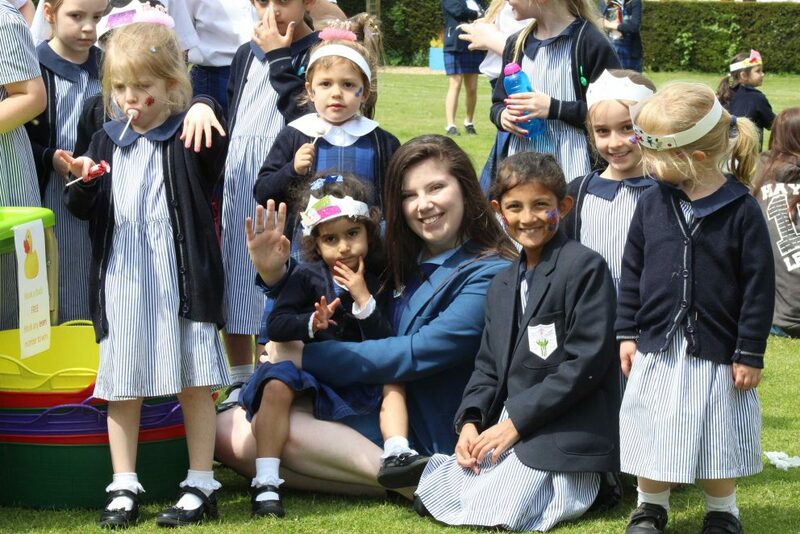 At lunchtime the Prep girls were treated to an array of activities run by the Sixth Form girls including face-painting, games and even fortune telling! A fabulous day raising money for this most worthy cause. On Friday 19th October, Poppy, Isabel, Imogen and Yasmine in Year 5 travelled to the Wycombe Swan theatre to learn about becoming E-Safety ambassadors for St Mary's Prep Department. cyber-bullying, how to use apps correctly, and how to keep safe when using the internet. They will be planning and leading an assembly with Senior House E-Safety ambassadors soon, so they can spread the E-Safety word! We have had a lot of fun in rehearsals for The Light Burns Blue. 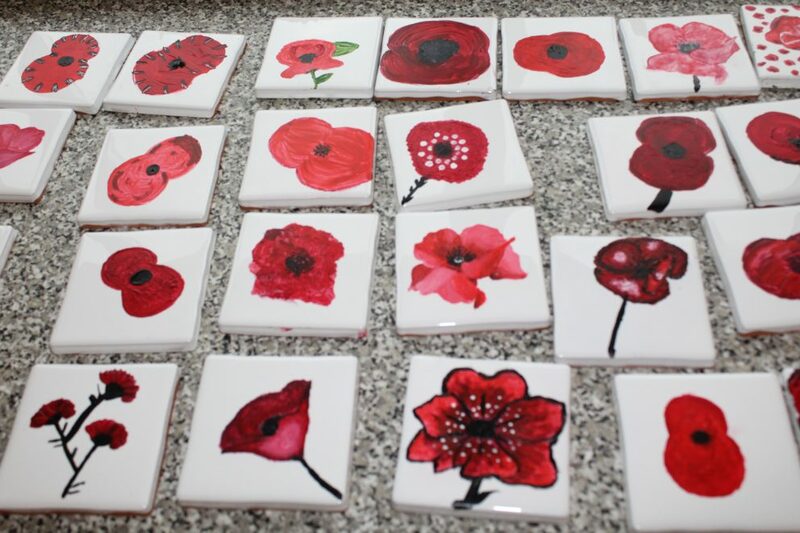 As Sunday 11th November marked the 100th anniversary of the end of the First World War, St Mary’s girls have been very busy carrying out a range of activities to mark this momentous date. form-time, our pupils have discussed and debated the issues surrounding Remembrance Day, the fund raising methods of the British Legion and why some choose to wear a white poppy. Our Year 13s were also fortunate enough to meet and listen to Major General Tim Inshaw, President of the Gerrards Cross branch of the Royal British Legion. They learnt more of the importance of Remembrance and the work of the Legion. Mrs Stansfield and Mrs Davison have also been delighted by the response to the request for stories of family relatives involved in the Armed Forces. There are tales of tragedy, heroism and very lucky escapes! We thank all of you that have sent in your stories and very much look forward to putting them together in a display. The week ended with an assembly in which our Chamber Choir sang In Flanders Fields and Dayna, Year 12, spoke of her visit to the battlefields of the Somme and Ypres. Lucy and Grace in Year 13 spoke of locals that fought in the wars and all pupils observed a two minutes silence. 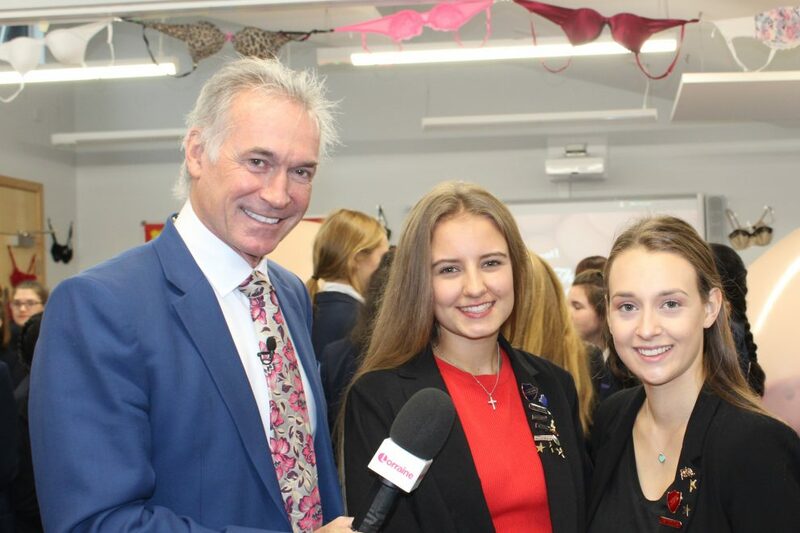 On Wednesday, 17th October, the Year 10 and Sixth Form Media Studies students at St Mary’s School in Gerrards Cross were excited to welcome Dr Hilary Jones and the film crew from the Lorraine Show for the filming of a live broadcast. ITV are working with a charity called Coppafeel! to support Breast Cancer Awareness Month and chose to film and interview teachers, parents and students from St Mary’s because of their involvement in an educational pilot scheme with the charity. Coppafeel! was founded by Kris Hallenga, who was diagnosed with incurable breast cancer at the age of 23, and her twin sister, Maren. The aim of the charity is to promote the message, specifically to young people, that identifying cancer early offers a higher chance of recovering and surviving. government in 2016 and as a direct result of the research, the government have announced that health education, including topics relating to preventing cancer and self-examination, is to become compulsory in all schools from September 2020. This was a monumental achievement for the work of those at #RethinkCancer and Coppafeel!, and Mrs Taylor was proud to have been involved in the pilot of 16 schools that were instrumental in providing the persuasive evidence of the benefits of spreading the message. Mrs Taylor is now a member of Coppafeel!’s Education Advisory Group, with the remit to develop a set of lessons and resources which Coppafeel! will produce and make freely available to schools. The resource pack, which she is developing, will support schools across the country to fulfil their statutory duties under the new regulations. Mrs Taylor commented, “It was very exciting for the students to be involved in live TV, but more importantly it was a great opportunity to continue to drive the message that self-checking from an early age is incredibly important. I am personally delighted to be involved in developing the resources that will enable schools to educate all children about the importance of self-examination”. Early Years were very excited to welcome PCSO Dobbin and PCSO Puksis to the school on Wednesday. car with its flashing lights and very loud siren! They even got to sit in the car and try on the high visibility jackets and a police hat. 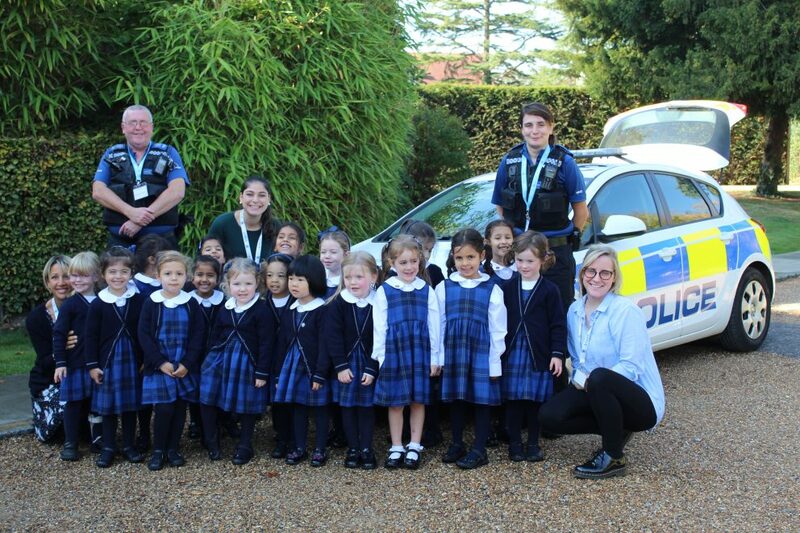 Perhaps we have some future Policewomen in Early Years! Tuesday 9 October saw the annual final of the Senior House Debate competition. effects of space travel on the ozone layer and NASA’s ever-increasing budget. 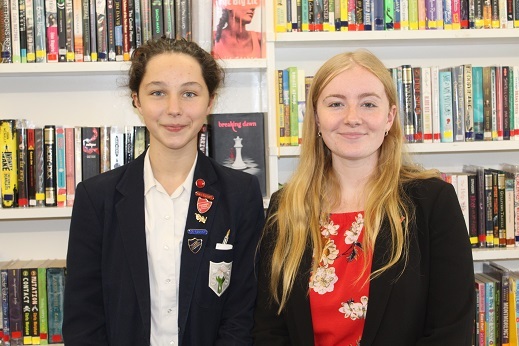 Latham were represented by Kat, Year 11, and Jazmin, Year 13, who gave powerful and emotive arguments on the benefits that space travel has brought to medicine, human curiosity and the mobile phone network – always a persuasive argument with teenage girls! By a count of 113 to 110 votes with 26 abstentions, Latham narrowly clinched a victory. Congratulations to everyone involved. 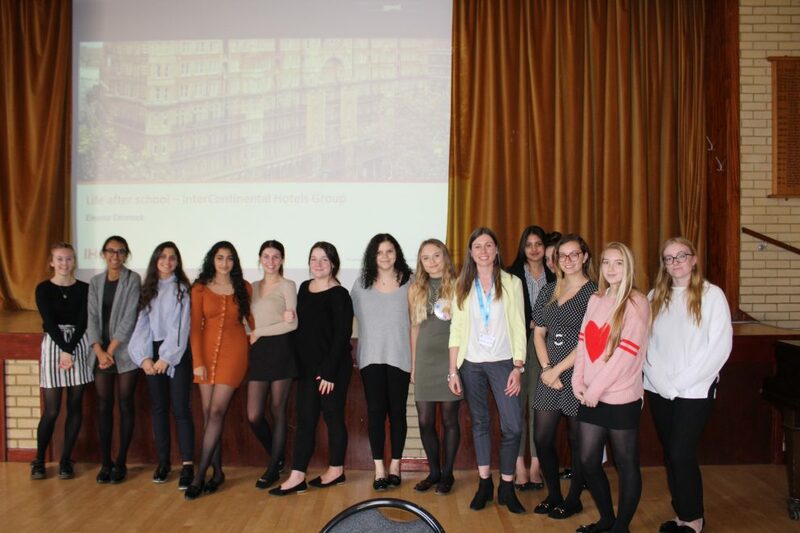 Last Friday, as part of their Enrichment programme, Year 13 had the pleasure of welcoming Eleanor Dimmock, our own Mrs Dimmock’s daughter, to speak about working in digital marketing. international hotel industry. She spoke passionately about how her experiences in her life as a young adult have shaped her work life, and how her passions and interests have now translated to her career. The girls responded to her animated talk by asking intriguing questions on work/life balance, sticking to deadlines, and what flying all around the world feels like. It was most rewarding to have Eleanor at St Mary’s and the girls thoroughly enjoyed the talk. 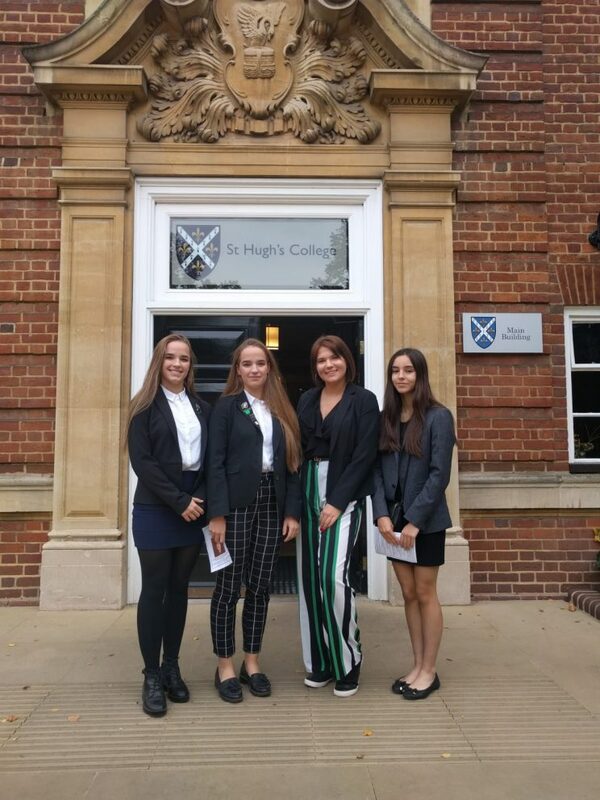 Grace and Scarlet, Year 13, and Millie and Isabelle, Year 12, were invited to St Hugh’s College, Oxford for a symposium in honour of the late Gwyneth Bebb, a former Old Girl of St Mary’s (1906 – 1908). Grace and Scarlet, Year 13, and Millie and Isabelle, Year 12, were invited to St Hugh’s College, Oxford for a symposium in honour of the late Gwyneth Bebb, a former Old Girl of St Mary’s (1906 – 1908). Gwyneth Bebb is considered a pioneer of the legal profession as the first woman to graduate with a First in Jurisprudence from Oxford, the only woman in an undergraduate class of 400 men, and for arguing Bebb v. The Law Society (1913), ultimately opening the legal profession to women in Britain. We first heard from Professor Senia Paseta, of St Hugh’s, on the remarkable life and impact of Gwyneth Bebb from being denied her degree because she was a woman, to being given membership at Lincoln’s Inn and being awarded an OBE for her war work in 1921.
excellent and very engaging, giving lots of funny anecdotes about their time in the legal profession including the first female Advocate General for Scotland, the Rt. Hon Elish Angiolini DBE QC and the Rt. Hon. Nicky Morgan MP. All panellists gave thought provoking and inspirational advice to guests. One of our favourite pieces of advice was from Carolyn Kirby OBE, the first woman to be elected President of the Law Society, who advised the audience to “never be afraid to be the first person to do something, someone has to be first”. Another was from Nicky Morgan, who encouraged us to “be brave – say yes to opportunities, then figure out how you’ll do it, find people to help you and persevere.” A wonderful day and a fitting tribute to the lasting impact of a St Mary’s Girl. 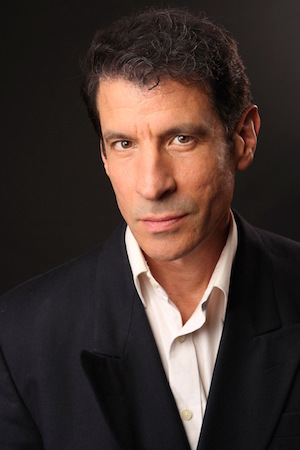 On Thursday evening we were delighted to welcome Dr Aric Sigman to St Mary’s, Gerrards Cross, to talk about ‘Parenting the Demanding Generation’ and the importance of a more joined-up approach to parenting children today. is a Fellow of the Royal Society of Biology, Associate Fellow of the British Psychological Society and a Chartered Scientist awarded by the Science Council. shoulder to shoulder and in partnership with their child’s school. Parents commented that the talk was very beneficial with lots of practical advice. We are delighted to welcome our new Head, Mrs Patricia Adams, to St Mary’s. Mrs Adams was formerly Academic Deputy Head at Blackheath High School for Girls, which, like St Mary’s, is an all-through school for girls aged 3 -18. 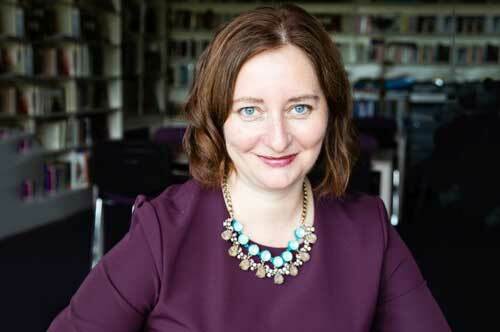 She has a wealth of experience in girls’ education, having previously worked in Senior Leadership at Norwich High School for Girls, Oxford High School, where she was Head of Upper School and Head of Spanish, as well as Headington School, Oxford, where she held the position of Head of Modern Languages. Mrs Adams read Modern Languages at St Catherine’s College, Oxford, studied for her masters in Applied Linguistics at Essex University and returned to Oxford for her PGCE teaching qualification. In the face of the reformed GCSEs our students once again returned an impressive set of results. With all results significantly above the national average, there was cause for celebration across the board. 50% of our students achieved the top grades in at least five subjects. Science results were particularly impressive: in Biology 88% of grades were 7-9 (A/A*), 55% of all Chemistry papers were graded 7-9 and for Combined Science the level was 67.5% at 7-9. Religious Studies achieved 92% of the grades at 7-9 and 100% 6-9. Congratulations to the students, all of whom have achieved even better results than they dreamed possible. 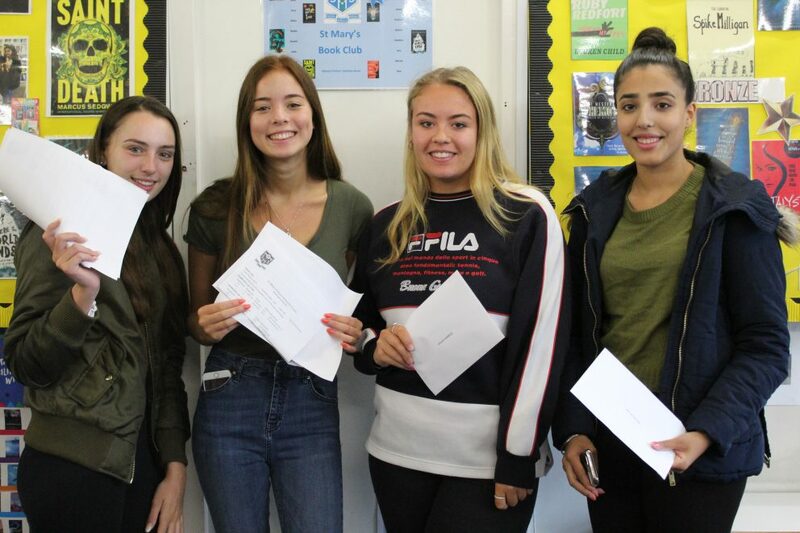 In the face of the reformed GCSEs St Mary’s School, Gerrards Cross students once again returned an impressive set of results. We are delighted that once again our Year 13 students have achieved an impressive set of A level results. 28% of all grades achieved were A*/ A (higher than the national average), 55% A*/B and 86% A*/C. The Extended Project Qualification entries once again achieved very impressive results with 67% graded at A* or A and 83% A*/B. 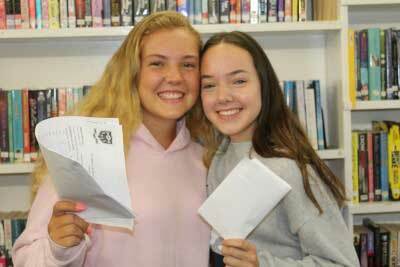 The girls now move on to a range of universities, including Liverpool, St Mary’s London, Birmingham, York, Cardiff and Exeter to study a wide range of subjects such as Dentistry, Law, English Literature, Equine Business Management, Politics and Economics, Real Estate Management, Criminology and History. These results are a tribute to the hard work of the girls and the strength of our teaching staff who work tirelessly with each individual to ensure they achieve their optimum results. A special mention goes to those girls with straight A*/A grades. 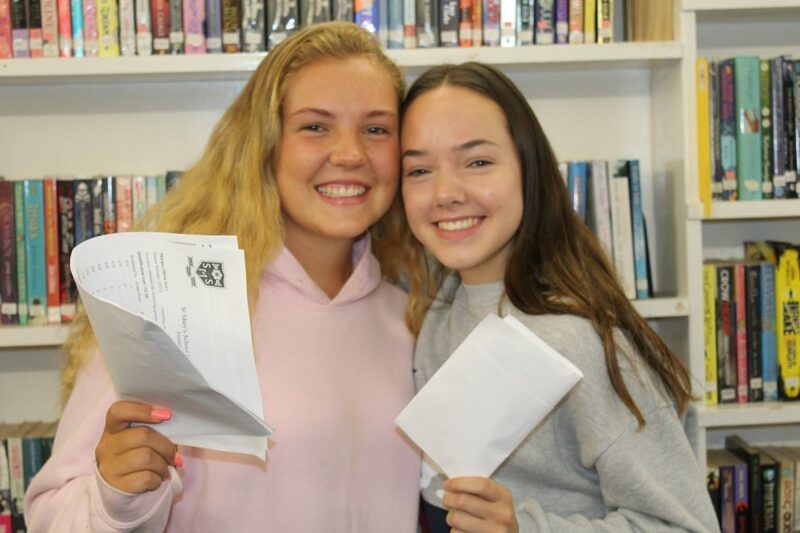 Mrs Ross commented, “It is so good to see the girls set fair for the next stage of their lives, to see the validation of all the work done by them, their parents and their teachers and to see them going off proud and confident as they embark on the next stage of their lives”. St. Mary’s School, Gerrards Cross, once again achieved a very impressive set of A level results this year. With 28% of results graded at A*/A and 86% A*/C there was good cause for celebration. our girls have achieved. 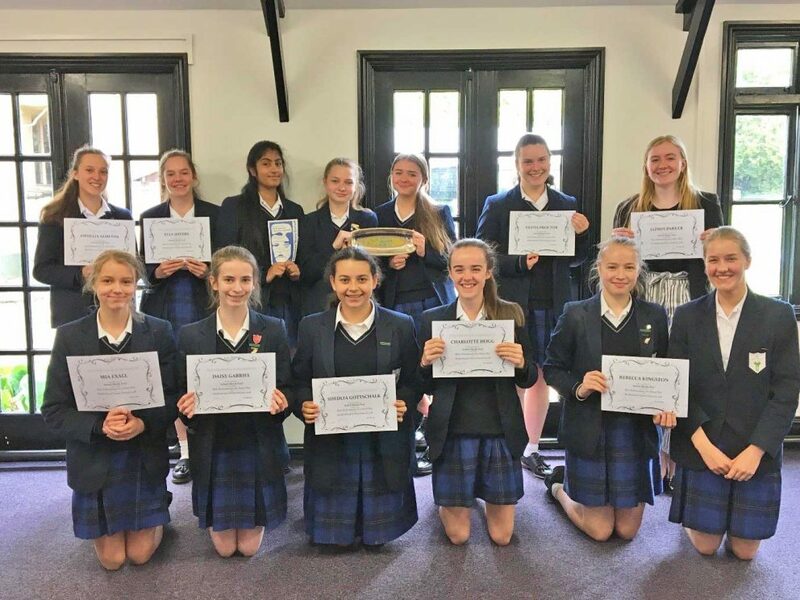 From those who have attained a full complement of top grades to girls who have worked hard to accomplish grades better than they had ever expected, we are proud of all of their achievements. We wish them all continued success as they move on to their chosen universities”. On Thursday 5 July, two teams went along to the first Junior Youth Speaks, held at Thorpe House School. On Thursday 5 July, two teams went along to the first Junior Youth Speaks, held at Thorpe House School. 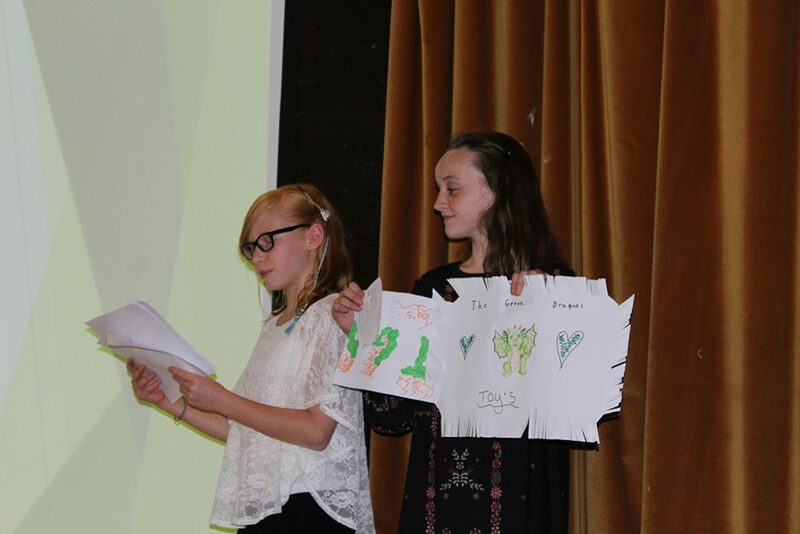 The Year 4 team, made up of Leyla, Marina and Isabel, chose to speak about children disconnecting from the great outdoors when they found out that 3/4 of children spend less time outdoors than prisoners. There was also a Year 5 team that consisted of Madison, Holly and Serene. After being inspired in English, these girls chose to talk about the decline of orangutans in the wild. Both teams spoke excellently, really showing off their talents in public speaking, a skill that is invaluable to them for the future. 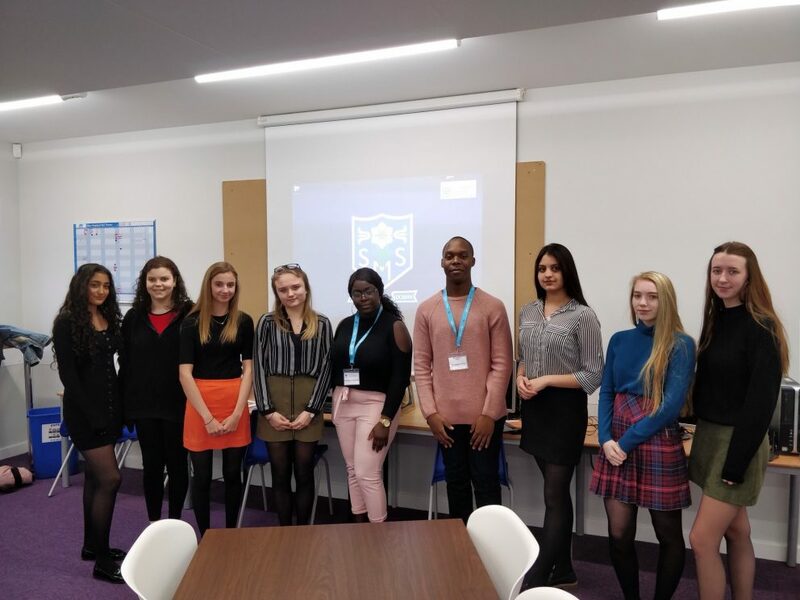 A Sixth Form Team lead by Orlaith, Year 12, organised a Model United Nations event for Year 8 at the end of Trinity Term. the team of Sixth Formers, and strongly debated by the Year 8 delegates, rejected a proposal by Nigeria and later accepted a proposal from Malaysia. All countries views were closely represented by their delegates which was challenging for some if their own personal views were different from the country they were representing. Congratulations go to Lana for winning the best delegate award for her skills of perceptive questioning, research and overall contribution to the event. 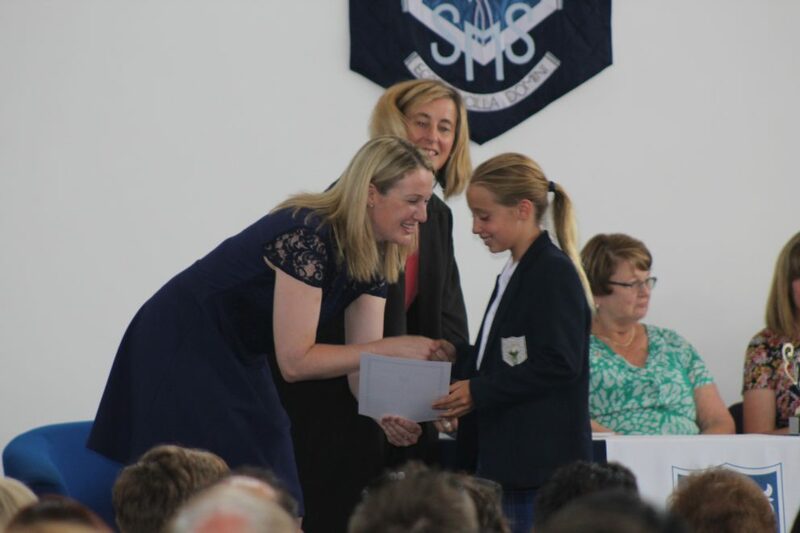 Speech Day was a wonderful affair on Saturday 7 July. also an opportunity to say a very fond farewell to our wonderful Headmistress Mrs Ross as she retires. Following Speech Day, guests were able to peruse the fabulous artwork completed by girls from Nursery through to Sixth Form at the annual Art Exhibition. The standard of work this year has been simply stunning. Congratulations to Mrs Douglass, Mrs Brown, and all the girls. 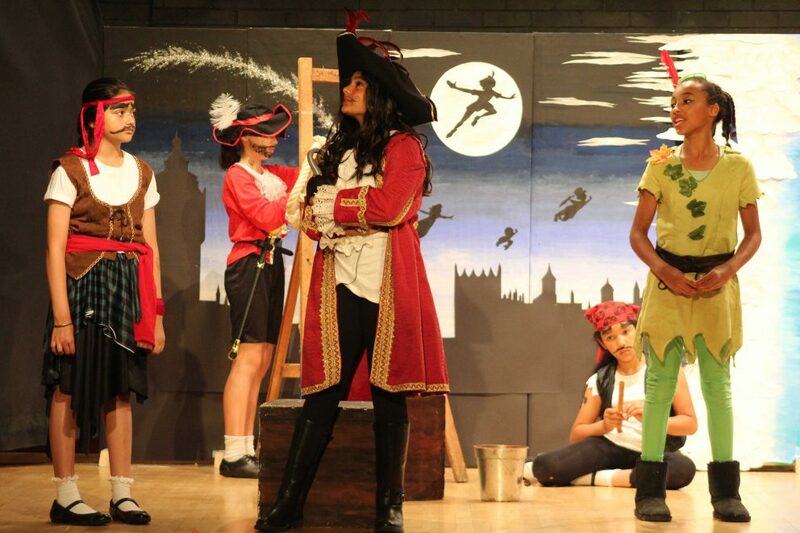 Congratulations to all of KS2 and their teachers on a wonderful production of Peter Pan in Pantastic. Congratulations to all of KS2 and their teachers on a wonderful production of Peter Pan in Pantastic. It was a visual delight with beautiful, bright scenery and stunning costumes. 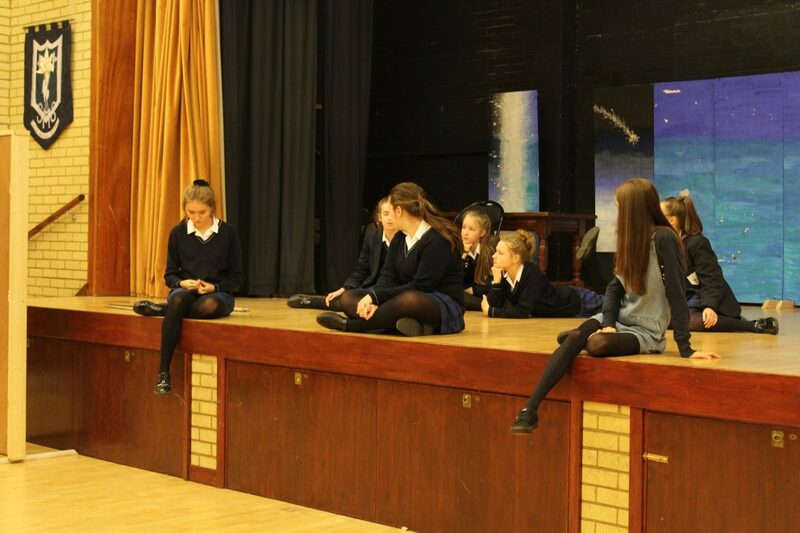 The acting and singing was superb, with many girls learning huge amounts of lines for the production. With truly moving sentiments about friendship and family there cannot have been a dry eye in the house at the end! For more photographs see our facebook page. A team of four Year 8 students competed in the STEM Olympics at Wycombe Abbey. 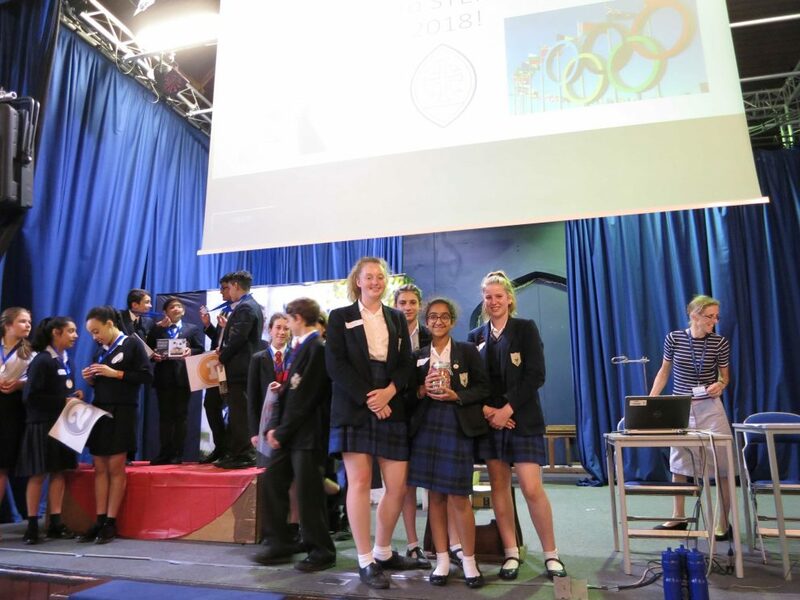 Over 100 students from the Chiltern and Buckinghamshire area entered this all day (Science, Technology, Engineering and Maths) Olympics competition. The challenges ranged from pure maths and application of science concepts, to practical skills and quizzes. The day was intense but our team took on each task with gusto and had very pleasing results. They had the fastest boat in the “Solar so Good” challenge and won 772 Smarties by using their maths skills to get the closed answer to the number of Smarties in a jar (their calculation was 784). Overall, it was an exciting day that stretched the girls and showed them how well they could do in a variety of challenging tasks. Congratulations to Siyona, Polly, Phoebe and Lucy for their effort and excellent results in this competition. Senior and Prep Sports Days were very hot occasions this year but it did not stop our girls from performing brilliantly, and supporting each other as always. Prep Sports Day started with a warm up for all of the girls which was followed by a series of events including throwing, high jump, egg and spoon races and track events, culminating in the House relay in which all the Prep girls participated. There were some excellent performances, including in the always competitive and fun parents’ races! The standard this year was very high in both the track and field. Phelix, Year 6, cleared 1.35m in the high jump, which is a new school record. We were delighted to welcome the new Headmistress for September, Mrs Adams, to present the medals. The overall winners were Temple West/Woodpeckers. 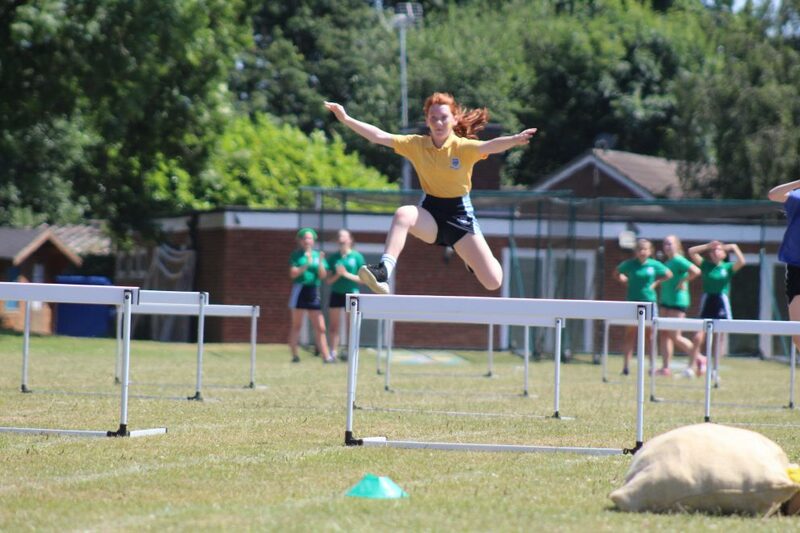 Sports Day for Senior House was also a lively occasion with some great field events in the morning, and competitive track events in the afternoon. As always, House spirit was in abundance, and the girls all supported each other, and their teachers! The winners of this event will be announced in a whole School assembly. It was fantastic to see the entire School competing in the open 1000 metres at the start of the day. There were a number of school records broken, with Freya Harrison clearing 1.45m in the high jump. There were many highlights and it was a great event. Well done to all staff and students for their achievements. 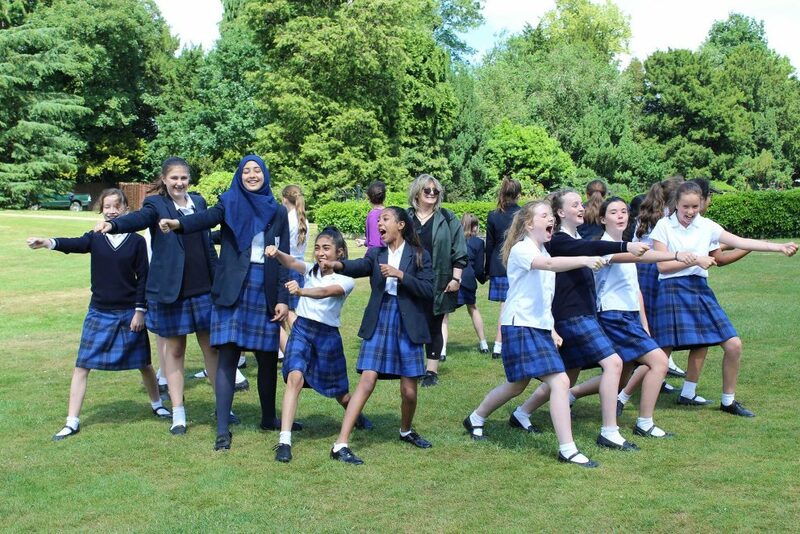 Thursday 21 June, was the momentous day that 45 Year 7 students victoriously attacked Warwick Castle. 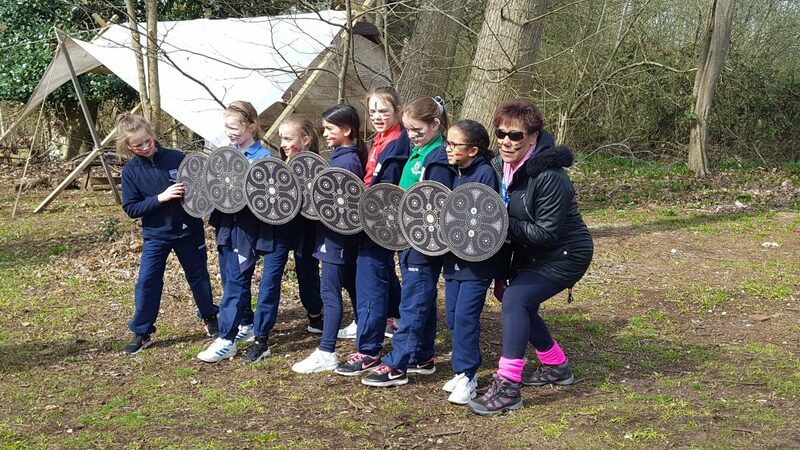 They were put through their paces by the drill master where they learnt the art of war, battle strategy and sword fighting, in their training to become knights. They worked as a team to walk in formation and learnt how to protect the King. They discussed different sword fighting techniques that they would need to parry, acted out by their own teachers. Then they went to the Trebuchet Master who gave them the low down on how to fire a this mighty beast of a machine. They learnt the engineering involved in creating, building and firing this device. The Trebuchet Master then gave them advice on how a trebuchet could be used to cause chaos and mayhem in the castle, like throwing over barrels full of bees or snakes, or even the decapitated heads of any emissaries sent to seek peace! After a short break for sustenance the knights of St Mary’s were ready for the off. First, they scouted out the area, discussing how well defended Warwick Castle was, with its high stone walls, ditch, arrow slits, crenellations and machicolations. Then they discussed what had happened in their siege of the castle (in the previous 2 weeks). How they had used their trebuchets, mangonels, ballistas to cause disorder inside the castle. However, they were wary not to destroy the castle, as they wanted to own and use this glorious castle themselves in the future once they had conquered it! They discussed their use of scaling ladders and siege tower, which had failed due to the ditch surrounding the castle. They discussed their attempts at mining the castle but the lack of right angles in their castles towers had saved the walls from collapsing. Finally, it was time to attack by the simplest of methods: walking through the open gates of the barbican! Luckily for them the portcullis’ were not in working order and they did not find themselves trapped in the killing zone, with murder holes and soldiers above them, with arrows and several buckets of human waste to drop on their heads. And so, the St Mary’s knights made it on to the Bailey. To secure their victory they walked the walls to admire their achievements and took a quick tour of the dark, damp gaol. If you are interested in visiting Warwick Castle with your family this summer, Warwick Castle would like to thank the school for taking Year 7 to visit them this year, by giving all our parents the opportunity to visit for half price. You do not need to have a daughter who is currently in Year 7 to take them up on this offer. You just need to book online with the code ‘SCHOOLS2018’. Mrs Patricia Adams has been appointed Head of St Mary’s School in Gerrards Cross. She replaces Mrs Jean Ross, who is retiring at the end of this academic year. Catherine’s College, Oxford, studied for her masters in Applied Linguistics at Essex University and returned to Oxford for her PGCE teaching qualification. Year 5 and 6 spent an adventure-packed long weekend at Condover Hall in Shropshire last weekend. 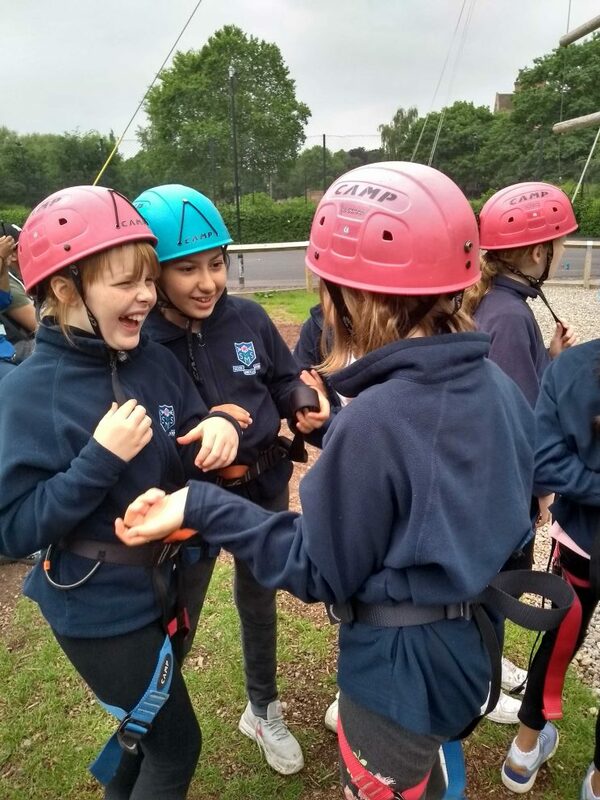 The weather was beautiful and the girls took part in a whole host of activities from buggy building and high ropes to wacky and wet fun and abseiling. They had opportunities to develop their problem solving and team work skills in an initiative skills sessions, and a healthy level of competitiveness was evident during mini-olympics and the run around quiz. It was great to see the girls and the teachers challenge themselves to try all that was on offer and a brilliant time was had by all! A special mention too, to Mrs Carney who abseiled for the first time and thought she may need a little “help” off the edge, but she did it! Year 8 were busy this week planning, making and selling healthy Smoothies as part of their Enterprise Day Challenge, in line with Healthy Eating Week. The girls have decided to donate all proceeds to Liberty’s Legacy- a charity promoting bone. This week the Year 8 students had their Enterprise Day challenge. This year, their task was to make, market and sell healthy smoothies, to kick start healthy eating week at School. The students also decided to donate all proceeds from the day to Liberty’s Legacy, a charity funding bone marrow research. The students were briefed before Enterprise Day by Mr Fernando and Mrs Roberts on budgets and ingredients, so as to reduce food waste and keep costs per team low. Each group was given a budget of £8 to spend in total. The day started with the teams selecting their team leader and other roles, and then coming up with creative team names which included: Tropical Galaxy, Fruit Attack, Schmaker, Groovy Smoothie, Shnabelle and Onflavour. Once this was done the students had to make an A4 leaflet that promoted their company as well as healthy eating. The students were also required to make an infomercial and a jingle to go with it, which allowed them to use their ICT and media skills. During break time the students carried out market research by asking other students and teachers a myriad of questions to facilitate their marketing and production. With this information in hand, the teams were able to come up with reasonable pricing and appropriate marketing techniques to lure their customers. Afterwards, the teams were sent to the Food and Nutrition room to make their smoothies. During the second half of lunch the teams began to sell! It was pleasing to see the teams using innovative methods to sell their product, which included charging different prices to different customers and taking the products to the customer when footfall was low. All teams managed to sell out within the first 15 minutes. The girls managed to make £67.45 for their chosen charity. The students then presented their infomercials and jingles along with their powerpoint presentations on how they got on throughout the day. It was very hard for Mr Dodd to judge the teams as they were all exceptional. Ultimately, team Groovy Smoothie beat team Tropical Galaxy by one point and emerged victorious. Well done to Sarah, Verity, Katie, Ambi and Molly. Congratulations also go to all the teams for their hard work on a very competitive Enterprise Day. Congratulations to our Year 7 Carnegie Shadowing Group. Congratulations to our Year 7 Carnegie Shadowing Group, whose video entry on their favourite book was chosen as runner up in this nation wide competition! The task was to create an 80 second video showcasing their favourite book from the Carnegie Shortlist. 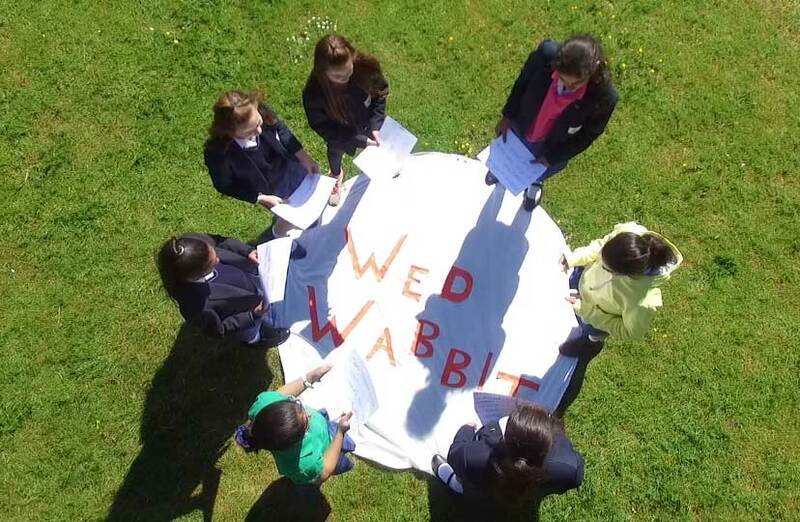 The girls chose ‘Wed Rabbit’ by Lissa Evans and used a camera drone to record their video. The School’s library will receive a free set of books as a prize. Well done, girls! On Tuesday Year 7 ventured southwest to the beautiful Jurassic Coastline. On arrival, they were met by an informative Lulworth Ranger who explained the main features of the area, as well as highlighting why the region is a World Heritage Site. 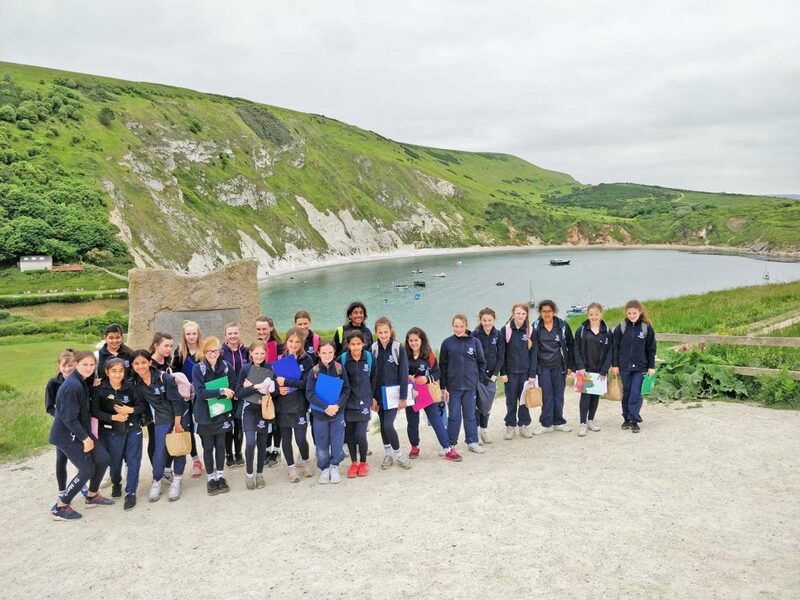 Pupils then visited Stair Hole and Lulworth Cove itself, learning about the geology and formation of each landform. They were introduced to the idea of erosion and how it is constantly affecting the coastline. After a picnic lunch and a quick ice cream, Year 7 braced themselves for the uphill coastal path to Durdle Door. The views were breath taking and a welcome break was taken so that the famous arch could be sketched and appreciated. After the downhill walk back to the coach, we started the long journey home. Happy but tired after a busy and informative day. 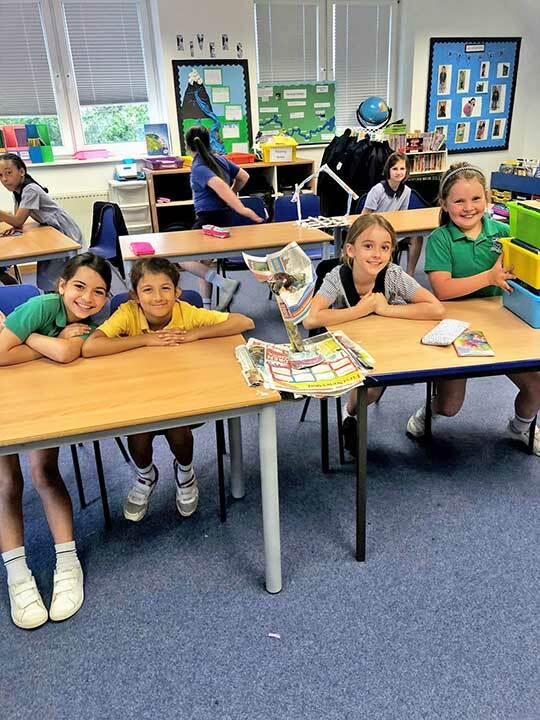 In their Thinking Skills lesson this week, Year 4 were busy constructing newspaper bridges. They worked in teams on the STEM task, which required a variety of skills to successfully complete the bridges, which had to be strong enough to hold 1kg. Some of the girls chose to focus purely on the structural side in order to achieve the strongest bridge, whereas others also included an aesthetic element in their design. Great teamwork, girls! 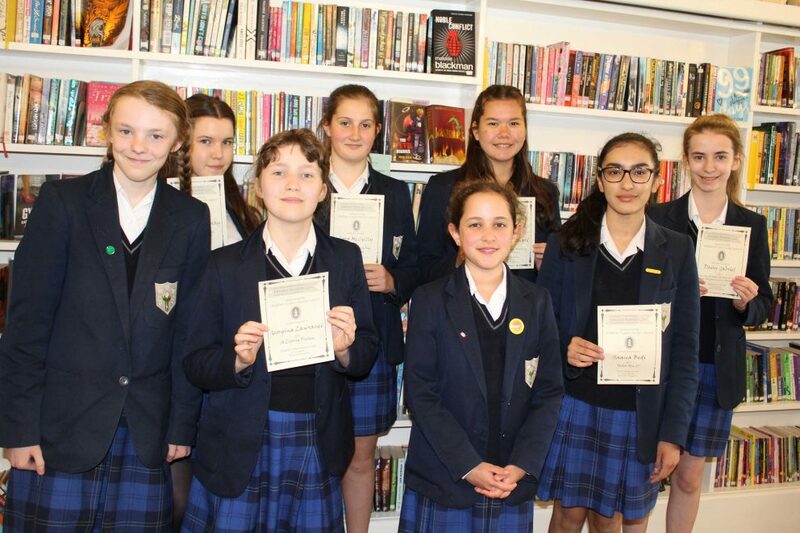 Congratulations go to several of our girls who won prizes or were commended after entering the Chalfont St Giles and Jordans Literary Competition, as part of the villages’ Literary Festival in May. 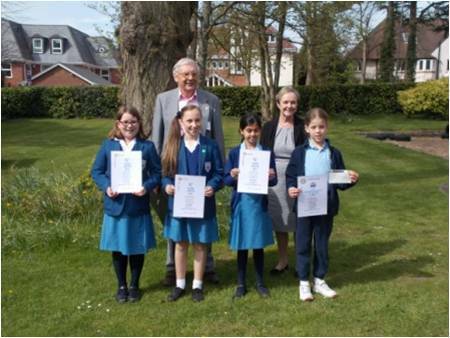 Congratulations go to several of our girls who won prizes or were commended after entering the Chalfont St Giles and Jordans Literary Competition, as part of the villages’ Literary Festival in May. The girls were given three quotes; “Aftermath”, “To die will be an awfully big adventure” JM Barrie (from Peter Pan) and “One way to make the most out of life is to look upon it as an adventure” William A Feather, American publisher and author, and were tasked with writing a piece of prose or poetry based on one of these. Winners in the Prose section were as follows; Molly, Year 7, in first place, Jasmine, Year 6, in second place, Daisy, Year 9, in third place and Georgina, Year 6 was highly commended. In the Poetry section, Saana, Year 9, was first, Jessica, Year 9 was second, Chloe-Marie, Year 9, was third and Cara, Year 9, was highly commended. The girls were all invited to receive their prizes at the Memorial Hall in Chalfont St Giles, and were able to read their pieces aloud to the festival-goers. Congratulations to all these girls, brilliant writing! The whole School spent a wonderful lunchtime on the Cedar Lawn on Friday, celebrating the Royal Wedding in the sunshine! The whole School spent a wonderful lunchtime on the Cedar Lawn on Friday, celebrating the Royal Wedding in the sunshine! 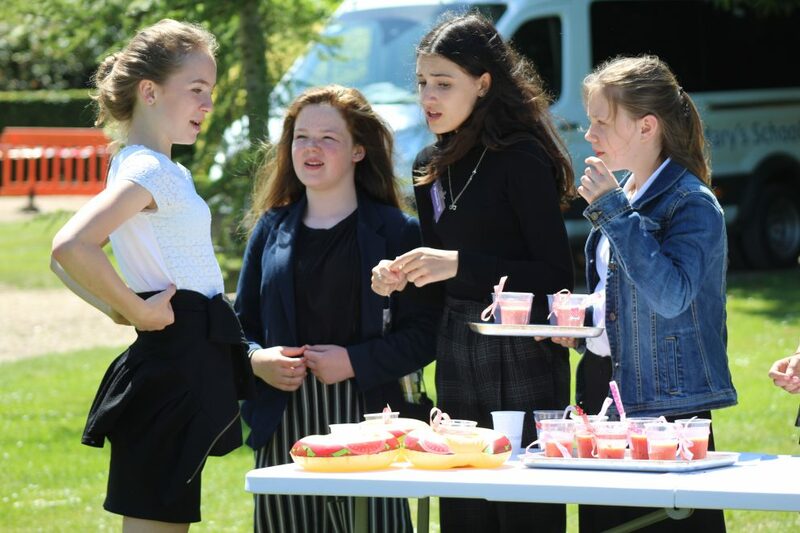 The girls enjoyed burgers and chips from the kitchen as a special treat, and lots of activities run by Year 13, including face painting and apple-bobbing! In the afternoon Prep Department had lots of fun with their Royal Wedding activities including making crowns, decorating cakes,a special Royal quiz, and making their very own wedding dresses! In mid-March, all of Year 10 Science Set 1 and several students in Set 2 competed in the 2018 Biology Challenge. This is a national competition administered by the Royal Society of Biology which aims to reward general biological knowledge rather than syllabus content. The results and grade boundaries have been released and we are delighted to report a fantastic haul of results: Gold award for Kat and Bronze awards for Ophelia, Maisie and Salma. Khyati, Amelia and Kaitlyn were highly commended, and Olivia, Riya, Rebecca, Freya, Millie and Jessica were commended. Fantastic news, well done to all these girls. 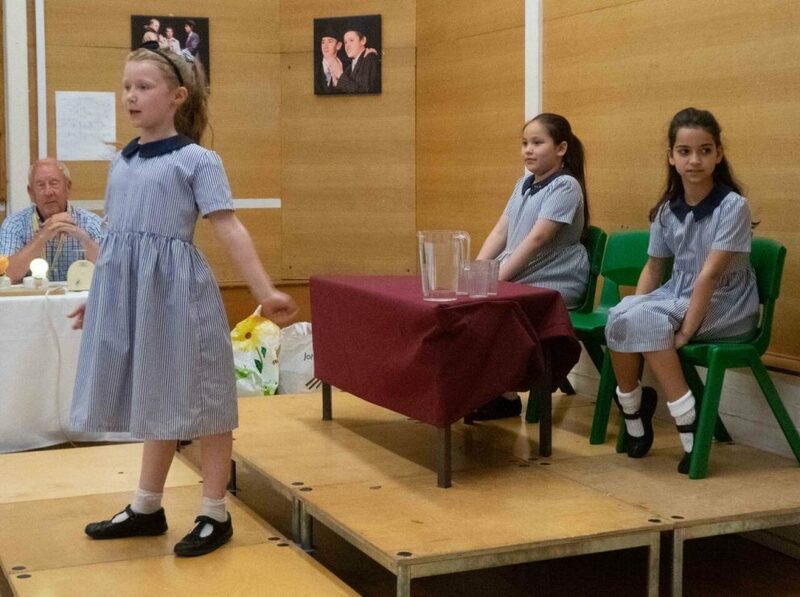 Spotlights Theatre, our after school drama club, competed at the annual Maidenhead Drama Festival on Friday 11 May at the Norden Farm Centre for the Arts. Spotlights Theatre, our after school drama club, competed at the annual Maidenhead Drama Festival on Friday 11 May at the Norden Farm Centre for the Arts. There were two performances of the plays ‘Round the World with Class 6’ by Nick Warburton and ‘Arbeit Macht Frei’ by Paul King. The festival is a competitive event, where a total of 12 plays are performed across the week. These plays are performed by adult groups, youth theatres, and colleges. Not only do the girls have to perform well, they are also given feedback from an adjudicator at the end of the night in front of the audience – some of the girls were more scared of this, than performing! The comedy ‘Round the World with Class 6’ was performed by students in Years 7-9, and focused on a class of students who had an absent teacher, but had left them work to complete. The classroom suddenly gets turned upside down as they re-enact the circumnavigation of Sir Francis Drake in 1577. ‘Arbeit Macht Frei’ is the tragic retelling of how the Jews were treated during the Second World War, and was performed by students in Years 9-12. The stylised performance showed how Jews were victimised and persecuted and how they were treated in the concentration camps. Two very different pieces, both with their own challenging tasks. We are pleased to announce that ‘Arbeit Macht Frei’ was awarded ‘Best Performance of a Short Play’ at the festival. 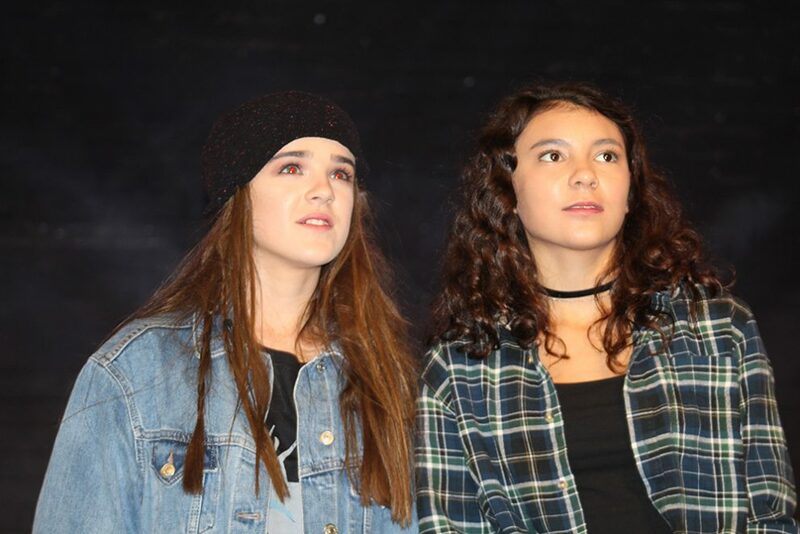 Well done to all of the girls involved in both performances, as they have spent the last few weeks in endless rehearsals, learning the lines and all with the impending examinations in mind. On a sunny Friday early in May, the girls in Prep were delighted to welcome their grandparents and special older people into their school. On a sunny Friday early in May, the girls in Prep were delighted to welcome their grandparents and special older people into their school. 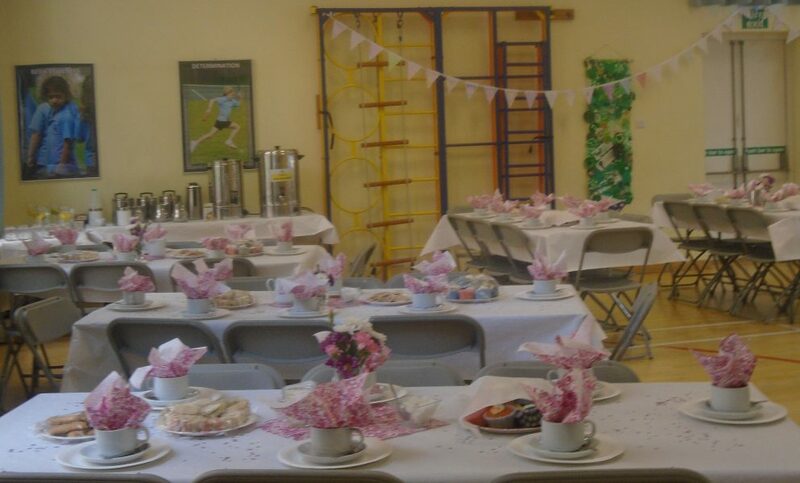 The visitors were taken on tours of the School with their grandchildren, treated to delicious cakes and cups of tea, and then listened to beautiful singing from all the girls, including a fabulous Mary Poppins medley. We hope everyone enjoyed this special afternoon. 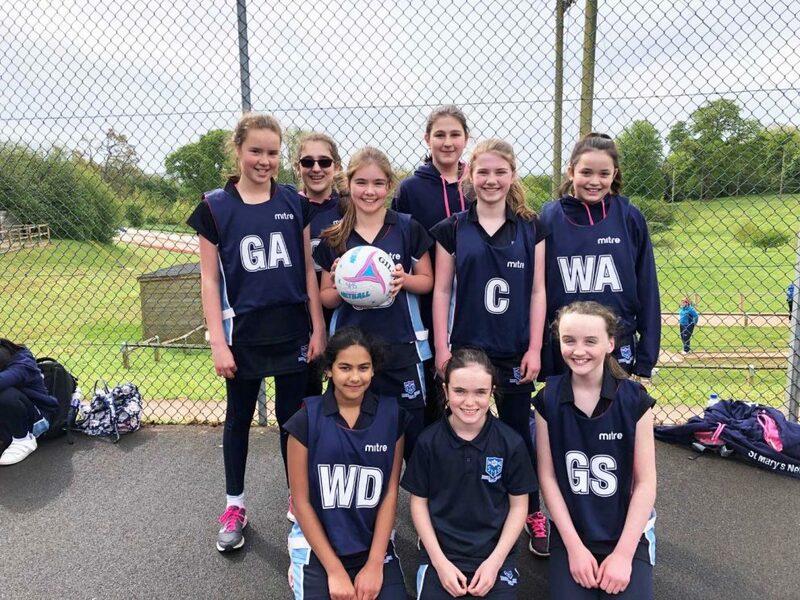 Last weekend Miss Wilkins accompanied five netball teams form Years 7 – 9 to the PGL Netball tournament in Devon, with each team playing six matches across the weekend. 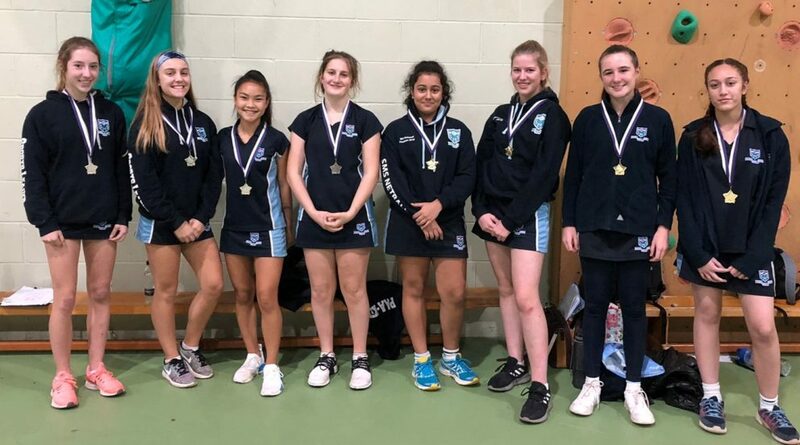 Last weekend Miss Wilkins accompanied five netball teams form Years 7 – 9 to the PGL Netball tournament in Devon, with each team playing six matches across the weekend. The results were mixed with some comprehensive wins, a couple of draws and some narrow defeats. The girls’ progress since September was very evident with excellent individual and team performances. Prizes were awarded to several girls, as voted for by staff and students. Player of the tournament from Year 7 Sky Blue team was Lucy who showed dominance in her position of Goal Defence, outstanding talent and her level of commitment to the team and determination to succeed was admirable. Player of the tournament from Year 7 Navy team was Charlotte with an outstanding performance and great in her role as a captain; she improved hugely over the weekend to be a dominant player on the court. Player of the tournament from Year 7 Yellow team was Layla. Layla was determined and vastly improved her performances in all the matches. Her confidence improved massively over the weekend and she was a true asset to her team. Player of the tournament from Year 8 was Rachel after an amazing performance in the centre court, working hard all of the time and always being a team player. Player of the tournament from the Year 9 team was Ria with outstanding performances in all her games; Ria really stepped it up to perform for her team. Lana received an award for Defender of the Tournament for her excellent defensive display and huge amounts of progress. Cara and Arabella were rewarded for commitment to their team, hard work and determination, coaching and mentoring younger students, supporting staff with activities and generally being brilliant to have on the trip. Both girls were excellent leaders and supporters and their help was greatly appreciated. The Most Improved Player of the Tournament went to Sophie, having developed defensively and in attack to be an asset to her team, Sophie was amazing! After all their matches, plus activities such as Jacob’s Ladder, abseiling and zip wire, the girls returned to School exhausted but happy and very much looking forward to next year’s trip! 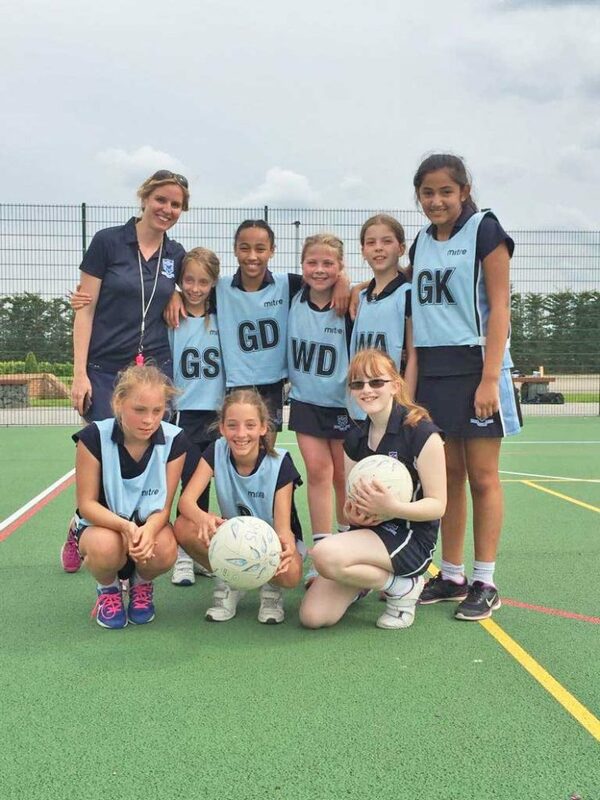 On Saturday 12 May, the Year 6 Netball team travelled to York for the Netball National Finals. On Saturday 12 May, the Year 6 Netball team travelled to York for the Netball National Finals. It was always going to be a tough day, with the top 20 schools in the country competing over the weekend. St Mary’s had a very tough morning of Netball, playing against some outstanding opposing teams. The team got better with every game and grew in confidence, showing fantastic resilience despite the scores not going their way. In the afternoon, the tournament was then split into; the trophy, the plate and the Bowl, based on how the morning games had gone. St Mary’s competed in the Bowl competition. The team’s opening game was outstanding. They showed how much progress they had made throughout the morning and played some excellent netball. They won their quarter final 6-1 and semi final 8-1. The girls met Alleyn’s Court in the final. They had played them in the group stages in the morning, and were narrowly defeated 4-5. It was an incredibly tense match that went from one end to the other. At one stage, St Mary’s were 4-1 up, and it looked like they were going to win it, but Alleyn’s Court came back fighting! The final score ended 7-8 to Alleyn’s Court but our girls played brilliantly. Well done to the team; Phelix, Kate, Megan, Kaia, Rehna, Scarlett, Lottie and Izzy. Tuesday 8 May saw a delightful assembly to pass over the Year 13 leadership roles. Tuesday 8 May saw a delightful assembly to pass over the Year 13 leadership roles. 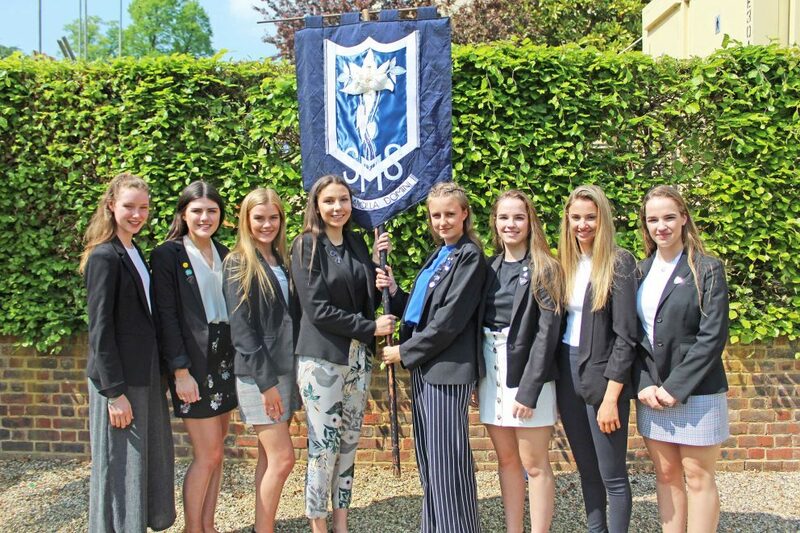 The outgoing Head Girl team and House Captains handed over responsibilities and badges to the incoming team and the School flag was lowered by outgoing Head Girl, Lizzie, to be raised by our new Head Girl, Annicke. A lovely appreciation for the fabulous work that the students have undertaken over the past year and a warm welcome for those taking on the responsibilities. Year 4 took a fun and educational residential trip to Flatford Mill last week. Year 4 took a fun and educational residential trip to Flatford Mill last week. Flatford Mill is famously immortalised by John Constable in his painting of The Haywain and the Mill is still recognisable. The girls had a very busy time shelter building, catching mice (humanely!) and studying them, splashing around in the brook and measuring the speed of it, and much more! 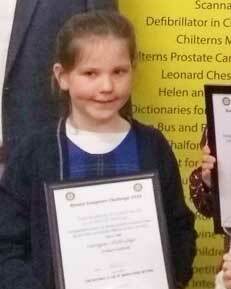 Congratulations to Imogen, Year 4, who won Second Prize in the Year 4 category of the Misbourne Matins Rotary ICT Competition. Congratulations to Imogen, Year 4, who won Second Prize in the Year 4 category of the Misbourne Matins Rotary ICT Competition. The competition was open to ten schools in the area and had over 1,000 entries. The children had to design a poster inviting people to a Sports Day event and include various IT presentation skills. Fantastic, Imogen! 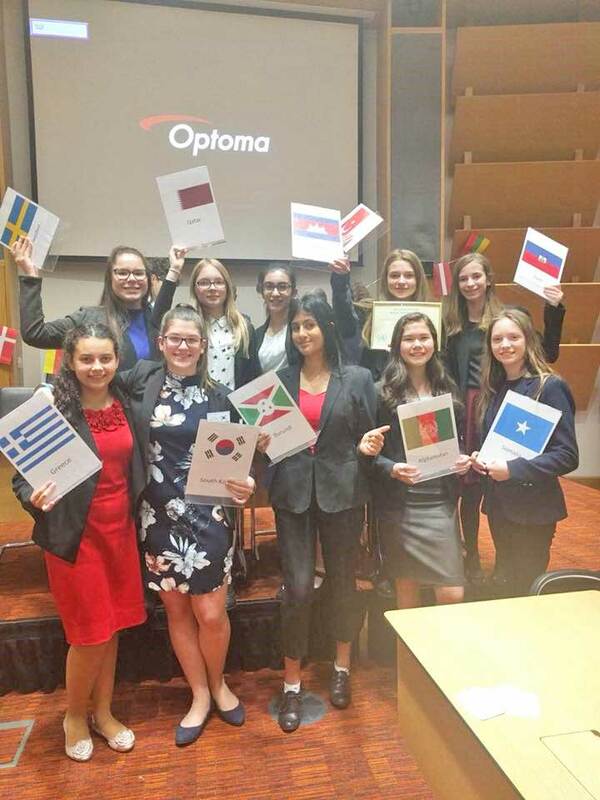 Congratulations to our Year 9 & 10 Model United Nations team who spent all of last Friday trying to solve the Global Food Crisis at Bucks County Model UN. 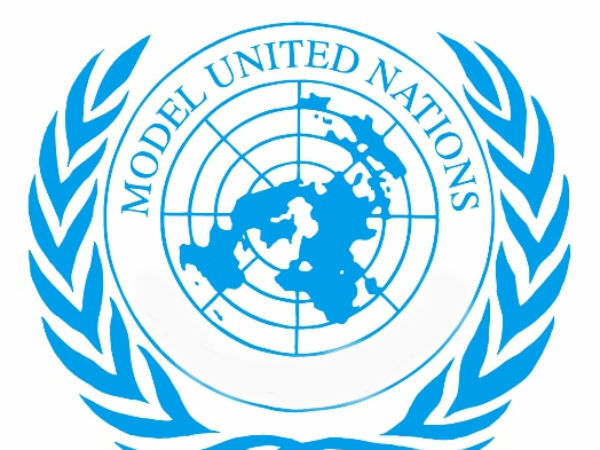 Congratulations to our Year 9 & 10 Model United Nations team who spent all of last Friday trying to solve the Global Food Crisis at Bucks County Model UN. With 10 essays written and over 20 speeches made on topics ranging from GM crops to food waste and climate change, they were eloquent, assured and the height of professionalism. Well done delegates! Special congratulations to Daisy, Saana and Millie for their awards! On Tuesday, a group of Year 7 girls enjoyed a fun afternoon at RAF Halton. Their car won the Race for the Line event at School last month, thereby qualifying them to compete against other schools. During the last few days of the Lent term, ten students and two staff set off for the biennial Languages trip to Germany. During the last few days of the Lent term, ten students and two staff set off for the biennial Languages trip to Germany. We flew to Cologne and stayed in the Köln Rhiel hostel in the city centre. It was the first time we had used the venue and it proved to be an excellent base from which to explore the city. On the first morning, after a hearty German breakfast, we set off by tram into the city. We visited the famous Kölner Dom (Cologne Cathedral) and marvelled at its enormity and history. We sampled some Eau de Cologne and then completed a city trail on foot. One of the highlights of the trip was undoubtedly the visit to the Lindt chocolate museum on the Rhine. We had an excellent guided tour and learnt lots of facts about the chocolate and its production. With Easter only a few days away, the gift shop proved a very popular place to spend some euros! We were all up early the next day for a morning of language lessons at the Hommer Sprachschule in Koblenz. We were made to feel most welcome and the girls enjoyed doing some work on numbers and holding conversations in German. We then paid a lunchtime visit to Cochem, a beautiful medieval town on the banks of the Moselle before continuing our journey by coach to Burg Eltz. The rain did not stop us enjoying the fairy tale castle and our guide certainly brought the past to life with some very interesting stories and facts! During the evenings, we enjoyed a delicious German dinner, followed by some diary writing and table tennis! On the last evening, we had use of the disco room for some music and dancing and the girls put on some entertainment in German for each other! Fun prizes were awarded and it made for a memorable last evening. The final day was spent at one of Germany’s top theme parks, Phantasialand. Spirits were not dampened by the changeable weather and much fun was had by all! All too soon it was time to collect our luggage from the hostel and make our way to the airport for the homeward flight. It was a long last day, especially with the flight delay, and ten tired but happy girls were reunited with their parents in the early hours of Good Friday! Miss Betteridge and I were most impressed throughout the trip with how much effort the girls put into using their German. They all entered into the spirit of the trip wholeheartedly and were great ambassadors of the school. Congratulations to our girls in Prep who entered the Chiltern Decorative and Fine Arts Society annual painting competition where the theme was “My Favourite Day.” Scarlett, Year 6, and Ava, Year 5 were both commended for their paintings, and out of several hundred entries from across the Chilterns, Chiara, Year 5, was awarded second place, and Maya, Year 6, was awarded Best in School. These girls attended a prize-giving ceremony at Chalfonts Community Library where their beautiful work was displayed. Lots of other girls were also awarded certificates for innovation or for having their work commended. Well done, girls! and convincing piece on ‘Which is more important, numbers or words?’ The judge also commented on her technical structure and how readable her essay was, displaying sound reasoning on a demanding topic. Well done, Holly! 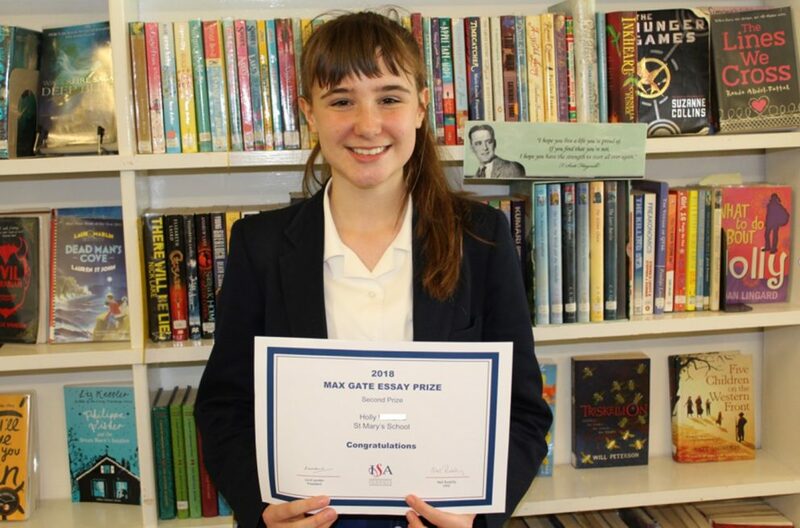 Congratulations to Holly, Year 8, who won second place in the Independent Schools Association's Max Gate English Essay Competition 2018. 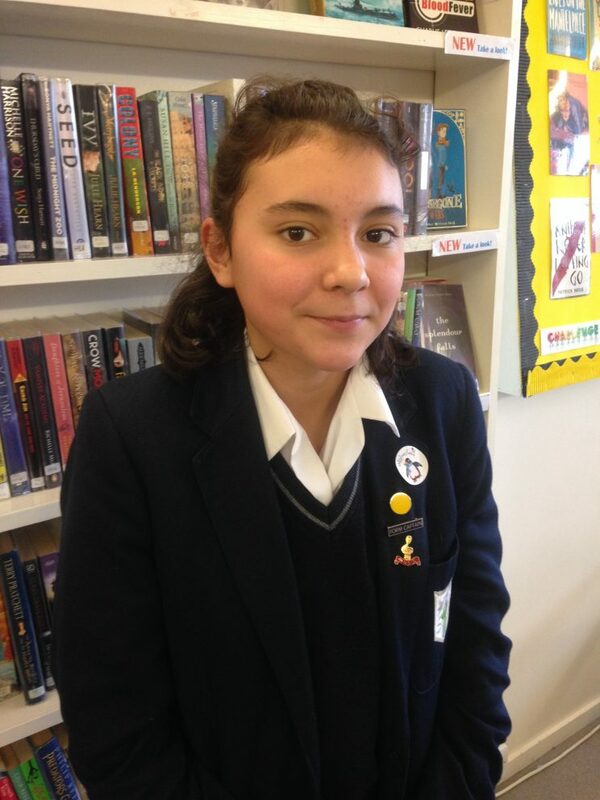 Congratulations to Holly, Year 8, who won second place in the Independent Schools Association’s Max Gate English Essay Competition 2018. She wrote a detailed, philosophical and convincing piece on ‘Which is more important, numbers or words?’ The judge also commented on her technical structure and how readable her essay was, displaying sound reasoning on a demanding topic. Well done Holly! On Monday 27 March, four of our promising students attended an Oxford and Cambridge Admissions Conference held at Epsom Downs Racecourse. On Monday 27 March, four of our promising students attended an Oxford and Cambridge Admissions Conference held at the rather lovely Epsom Downs Racecourse. As well as picking up to tips about how to succeed in the competitive admissions process, the students were able to select sessions from Oxford and Cambridge subject specialists on a range of courses from Medicine to Law, Oriental Studies and Anthropology. Meanwhile staff were given up to date advice on how best to support their students with their applications.The students who attended were very enthusiastic about the day and found it extremely useful. Congratulations to our Model United Nations team who performed brilliantly at Haileybury College's MUN conference over the weekend. Congratulations to our Model United Nations team who performed brilliantly at Haileybury College’s MUN conference over the weekend. The theme of the event was “Open Mind, Open World” with topics from the Myanmar situation and Ocean Litter, to Truly Representative Governments and Tax Havens being debated. A special well done to Chloe who was awarded Highly Commended Delegate award for her work on the Environment Committee. The Year 6 girls have been busy getting in to the Easter spirit! The Year 6 girls have been busy getting in to the Easter spirit! 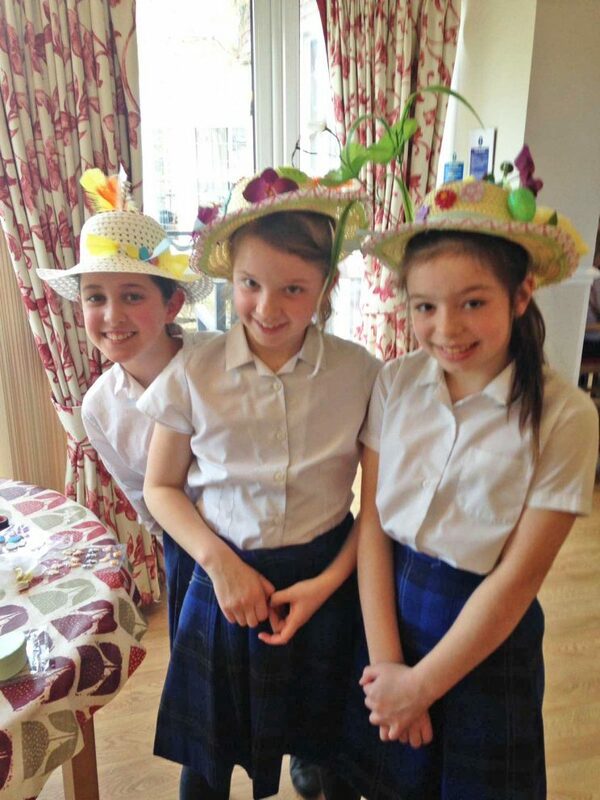 6C visited Swarthmore House and sang a selection of songs beautifully for the residents, before working with them to make some very striking Easter Bonnets. 6H were busy too, working closely with the Nursery and Reception girls to find clues to complete a puzzle before completing some Easter activities with them. Well done, girls! Congratulations to our Year 6 and 8 Netball teams who both made it to the National finals of the ISA netball tournament! netball to Knightsbridge. The Year 8 team came second in their group competition. They won convincingly against The Mount School in the semi-final and lost to St James in the final. Both teams have now qualified for the National finals this weekend in York. Amazing netball, girls! 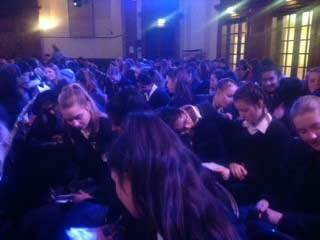 The Whole of Year 10 travelled to London on a very cold and snowy day to attend a GCSE Maths in Action Day. They listened to a variety of inspirational speakers from very different backgrounds; teachers, lecturers, mathematicians, a TV presenter and also a maths populariser and YouTube sensation. The aim of the day was to show how mathematics is embedded in all that we do, in ways we may never have thought of. Some of the demonstrations were on topics that one might expect like code-breaking in WWII and how the Enigma code was broken. Although the girls found this topic interesting they were certainly more captivated by how that led to the discovery of passing and receiving information over the internet and messaging. They were especially impressed by the demonstration that drilled a hole in a CD to show that the information could still be read by the CD player and therefore the CD could be played as normal. The girls had the opportunity to play games and discover how mathematics can be used to win games based on the ancient game of Nim. The mathematics behind the chances of winning in a game show were demonstrated and also how mathematics can be used in magic too. One of the sessions was aimed directly at how to study and revise for GCSE exams; some of the girls have already adopted one of the recommendations to create a mistakes book to try and eliminate repeating errors and learn from them instead. Another presenter described the mathematics involved in the flow of chocolate in a chocolate fountain. Her study then led her to analyse the flow of food sauces and custard and the findings from this research have led to the improvement of bullet proof vests – who would have expected that! Can we believe everything we read in the papers? This session showed how the media constantly misuse, misinterpret and abuse statistics in order to dramatise and create headline news. This opened the eyes of our girls to the potential pitfalls of listening to and acting upon sensational claims we see every day on TV and the internet. Understanding how data can be used to influence society is certainly something that will affect all of our lives in years to come. The girls all agreed that the day had been incredibly beneficial and enjoyable! 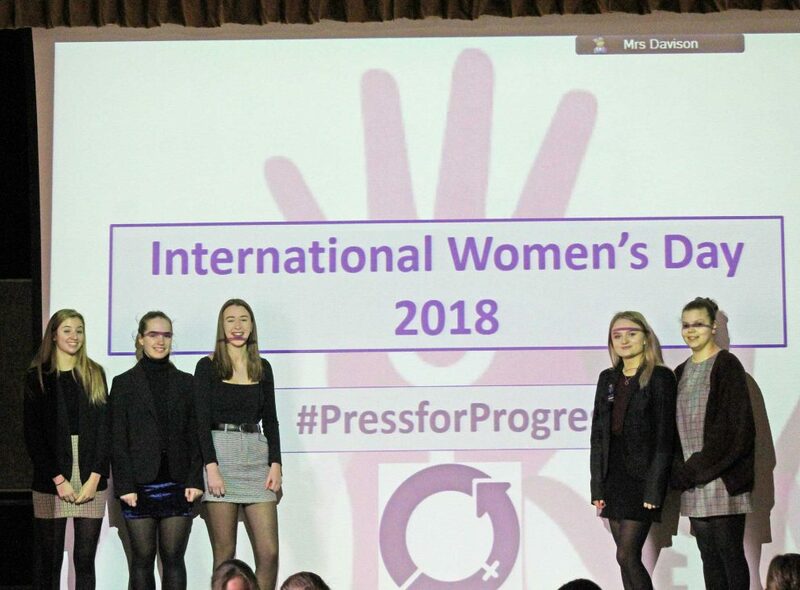 On Thursday our girls came together in assembly to celebrate International Women’s Day. On Thursday our girls came together in assembly to celebrate International Women’s Day. In this centenary year of women obtaining the right to vote and in light of recent Hollywood scandals and the World Economic Forum predicting it will take 217 years to close the gender pay gap, it seems that recognition of this day is more important than ever. The theme of this year’s day is to ‘Press for Progress’. 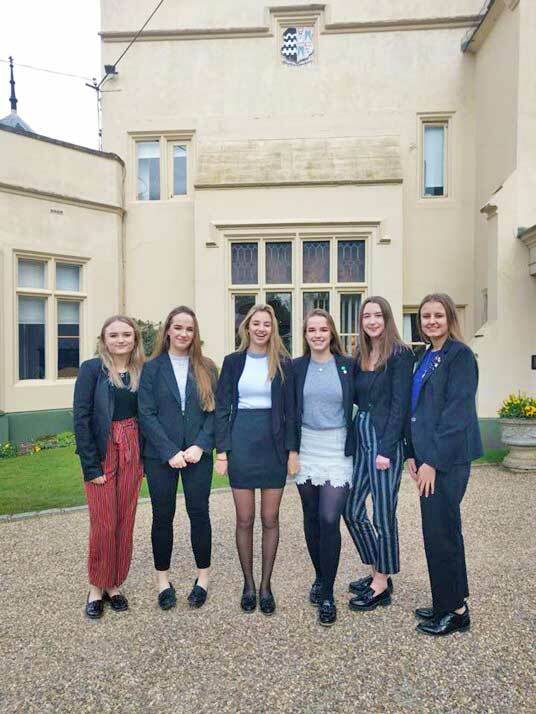 Orlaith, Chloe, Lucy, Olivia and Grace in Year 12 shared with us how they intend to do this, ranging from celebrating the achievements of women to maintaining a gender parity mind-set. Most importantly, our girls took away the key message that they should never allow their gender to hold them back. On Friday, the Year 6 and 8 teams attended the regional competition in the Independent School’s Association Netball tournament. The Year 6 team was undefeated throughout the competition and got through to the final. They lost 6-5 in a very close and exciting game of netball to Knightsbridge. The Year 8 team came second in their group competition. They won convincingly against The Mount School in the semi-final and lost to St James in the final. Both teams have now qualified for the National finals this weekend in York. Amazing netball, girls! Last Friday our team of Eco Warriors, with girls from Prep to Sixth Form, held “The Big Swap Event”. Last Friday our team of Eco Warriors, with girls from Prep to Sixth Form, held “The Big Swap Event”. As part of our School’s commitment to reducing landfill and educating pupils about a more circular economy, students and teachers were invited to bring in any unwanted items from home, in order to swap them for something they might use more regularly. 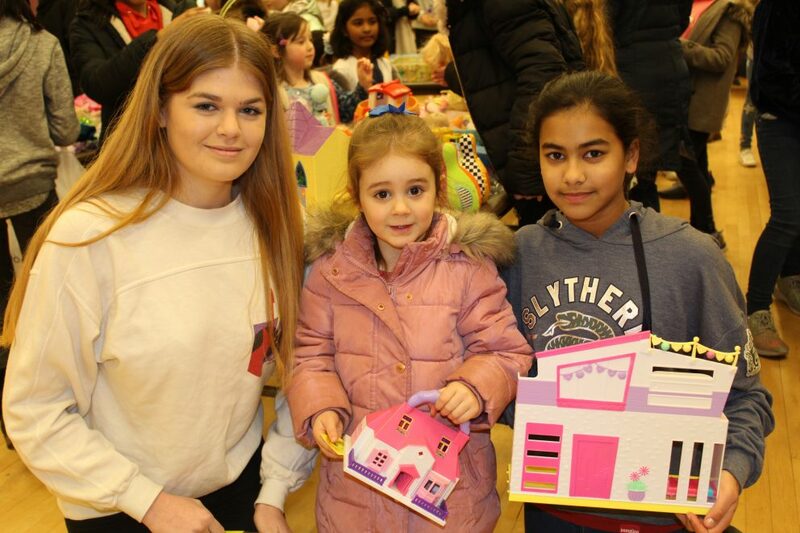 The response was amazing and girls from across the School were delighted to be able to take home a new toy or item of clothing, whilst helping to reduce landfill. Our Year 8 Maths students used their maths skills to calculate the amount of landfill that had been saved and it came to 12.85m3. So, a very worthwhile event! 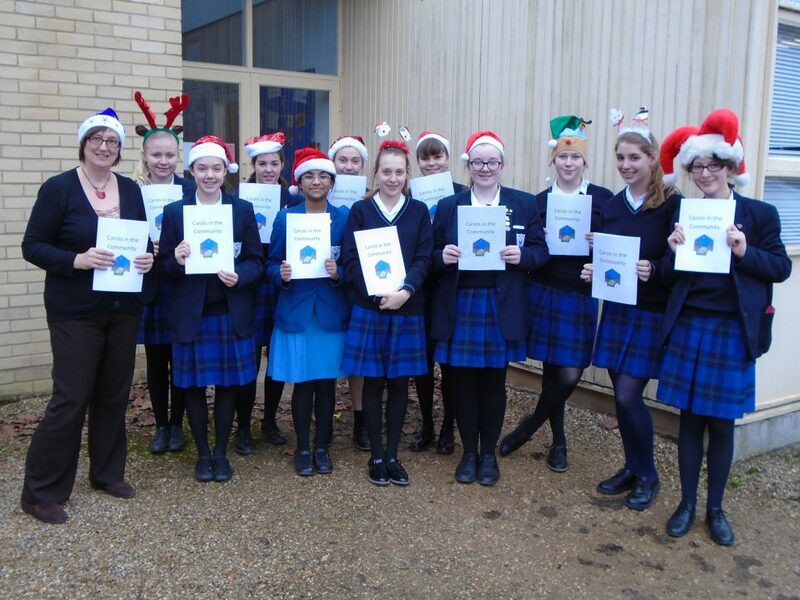 Recently, St Mary's School's team of Eco Warriors, with girls from Prep to Sixth Form, held “The Big Swap Event”. and girls from across the School were delighted to be able to take home a new toy or item of clothing, whilst helping to reduce landfill. Our Year 8 Maths students used their maths skills to calculate the amount of landfill that had been saved and it came to 12.85m3. So, a very worthwhile event! On Thursday, the Senior House Inter-House Music competition took place. 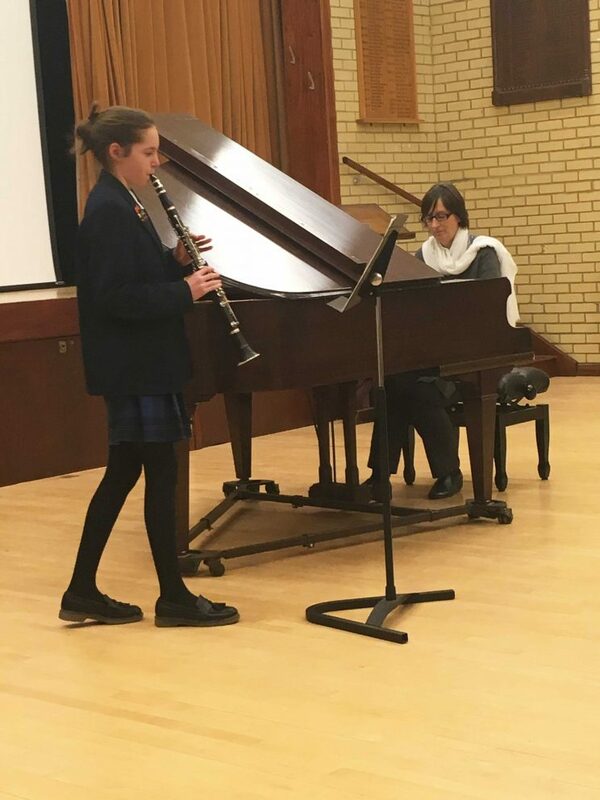 Girls from Year 7 through to Year 13 contributed musical pieces from piano, flute and clarinet to beautiful singing performances. On Thursday, the Senior House Inter-House Music competition took place. Girls from Year 7 through to Year 13 contributed musical pieces from piano, flute and clarinet to beautiful singing performances. We were delighted that Cecily Redman, former St Mary’s student and Deputy Head Girl, who is now a singing teacher here at St Mary’s, was able to judge the competition. Cecily was more than qualified to oversee proceedings, having recently graduated from The Royal Academy of Music with an MA and DipRAM in Musical Theatre with Distinction. Cecily commented, “I was pleased to hear such a variety of music and I was very impressed with the standard of performances. It was delightful to see how well the students performed, the confidence they displayed and the pleasure they took from participating”. Congratulations to Temple West, who were the overall winners. On Sunday, 15 students from Years 11 and 12 participated in the Model United Nations Day, which was held at Dr Challoners Grammar School. MUN is an educational simulation and academic activity in which students learn about diplomacy, international relations, and the United Nations. It teaches participants researching, public speaking, debating, and writing skills, in addition to critical thinking, teamwork, and leadership abilities. The aim is to engage students and allow them to develop a deeper understanding of current world issues. Participants in Model United Nations conferences are placed in committees and assigned countries to represent, or occasionally other organizations or political figures, where they represent members of that body. They are presented with their assignments in advance, along with a topic or topics that their committee will discuss. Delegates conduct research before conferences and formulate positions that they will then debate with their fellow delegates in the committee, staying true to the actual position of the member they represent. At the end of a conference, the best-performing delegates in each committee are recognized. Our students gave speeches, in front of up to 130 people, on “Conventional Weapons”, the “Rohingya Crisis in Myanmar” and the “Ongoing Human Rights Situation in Crimea and Sevastopol”. They worked incredibly hard and threw themselves wholeheartedly into an unfamiliar, and somewhat daunting, situation. Emily was congratulated for making an excellent speech, and Isabelle won the Highly Commended Delegate award. Our School gym squad continued their impressive run of success last Sunday. 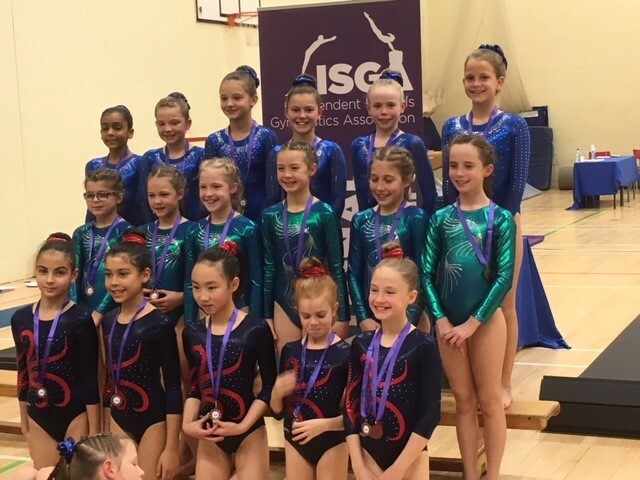 This time the U11 and U14 teams both won Silver medals for their performances at the BSGA Floor and Vault Competition, which was held at St Mary’s. Well done, girls! 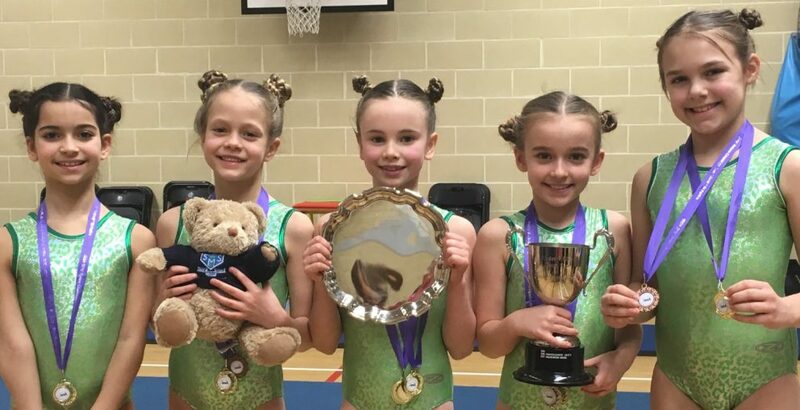 St Mary’s under 9 Gymnastic team swept the board at last weekend’s ISGA 4 Piece Challenge Cup, at St Faith’s in Cambridge. 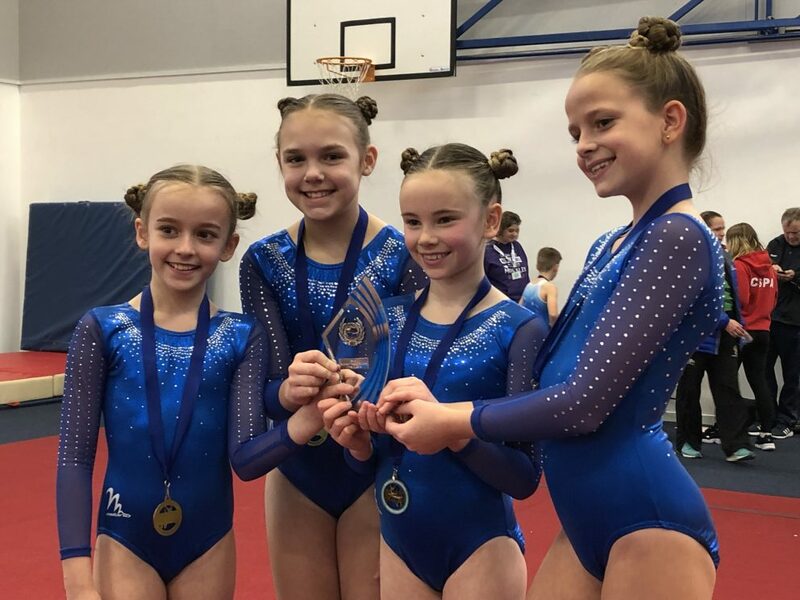 The team, consisting of Olivia, Leyla, Lucy, Lily-May and Eden, competed as individuals performing one set and one voluntary floor routine and vault. All the girls performed brilliantly against gymnasts from ten other schools from across the UK, with Olivia taking the Gold, making her National Champion, Lily-May won Silver and Eden won Bronze! A fabulous achievement which led our girls to win over all as a team as well. Last Friday, 19 January, our talented public speakers took part in the local heat of the Rotary Youth Speaks competition, hosted by Thorpe House School. Well done to all of these talented young ladies – they made us very proud. 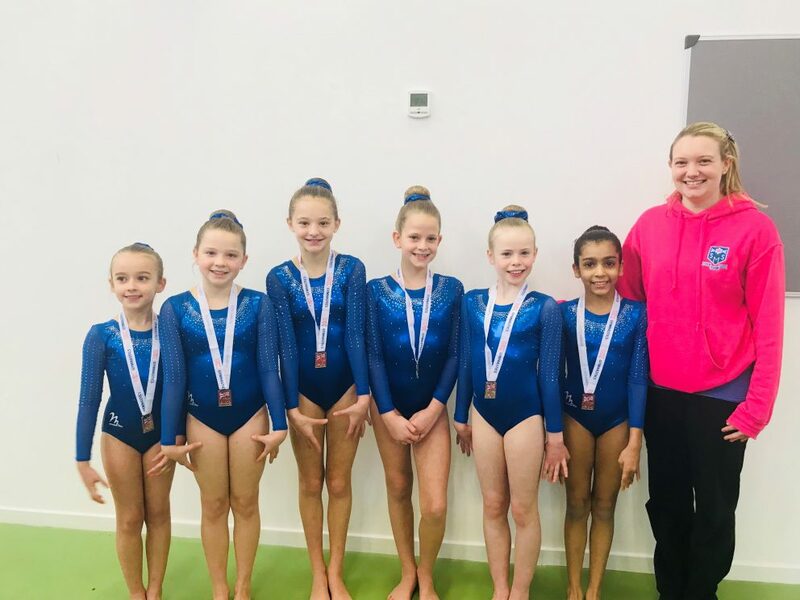 Hot on the heels of their recent success at the BSGA regional finals, St Mary’s School in Gerrards Cross had yet more gymnastics success last weekend. gymnasts from schools across the UK, performing one set and one voluntary routine for both floor and vault. 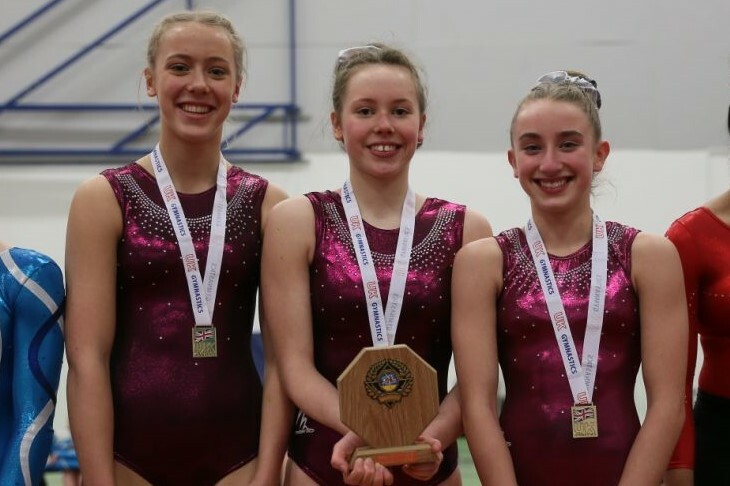 Olivia won Gold, making her National Champion, Lily-May won Silver and Eden Bronze, meaning that the team were clear winners of the competition overall. Many congratulations to our gymnasts who competed in the BSGA Milano Regional Championships this weekend. They all performed brilliantly, with the U16 team winning the competition and the U11s coming second. We were delighted to host the prestigious British Schools Gymnastic Association, Milano Trio south region finals competition last weekend. Several local schools competed; Wycombe Abbey, Dr Challoners High School, Maltman’s Green and Beaconsfield High, as well as schools from across Hampshire, Berkshire, Oxfordshire and Bucks. The U16s team comprised Freya, Poppy and Charlotte, whilst Tilda, Hollie, Rosie and Maya were in the under 11 team. All participants performed individual floor and vault routines and then a group routine. Our Under 16s scored the maximum possible for their group routine choreography, which was put together by Emily in Year 12. Both teams now go on to compete in the BSGA National competition in Stoke on Trent on 16-17 March. Well done, girls! 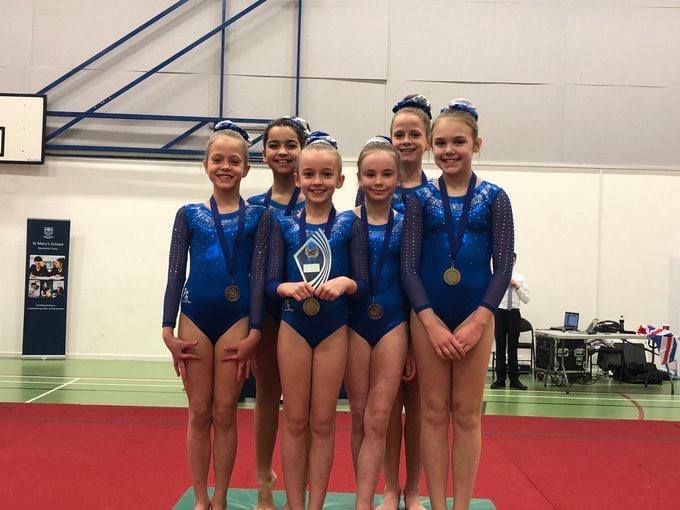 Gymnasts from St Mary's School, Gerrards Cross, competed in the BSGA Milano Regional Championships last weekend. They all performed brilliantly, with the U16 team winning the competition and the U11s coming second. second. 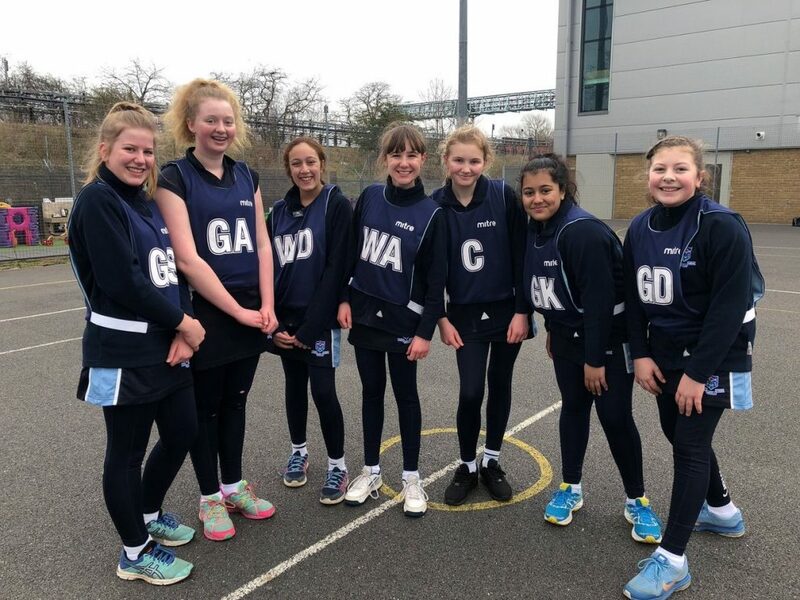 The U16s team comprised Freya Harrison, Poppy Metcalf and Charlotte Sykes, whilst Tilda Sykes, Hollie Harris, Rosie Marshall and Maya Raja were in the under 11 team. All participants performed individual floor and vault routines and then a group routine. The St Mary’s Under 16s scored the maximum possible for their group routine choreography, which was put together by Emily Firman, Year 12 St Mary’s student. Both teams now go on to compete in the BSGA National competition in Stoke on Trent on 16-17 March. The Prep Department has a team of “Eco Warriors” who have spent the last two weeks promoting ‘switch off fortnight’, which culminated in ‘No Electricity Day’ on Friday 1 December. ‘No Electricity Day’ was a bid to raise awareness of climate change and to help encourage the girls to become more eco- friendly. Throughout the day all computers, printers, interactive white boards and even lights were switched off to highlight how much electricity we use, but also to see how well we can survive without it. The girls found it strange not being able to switch on lights or use the interactive whiteboards, but enlightening too as they did recognise how reliant we all are on electricity. Year 1 wrote stories by “candlelight”, Year 2 learnt about the world using a giant map, rather than the IWB, and Early Years learnt the story of Christmas using puppets. The challenge going forward is to see how we can reduce our electricity consumption on an ongoing basis and perhaps chat, read and play board games, instead of relying on TV or the internet for entertainment. 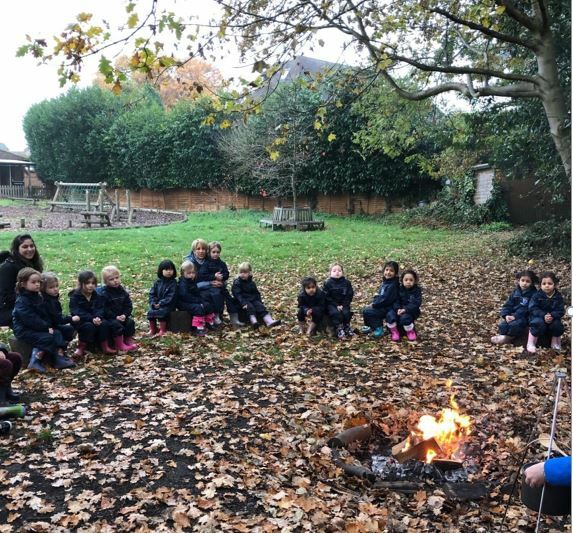 The Prep Department at St Mary’s School, Gerrards Cross, has a team of “Eco Warriors” who have spent the last two weeks promoting ‘switch off fortnight’, which culminated in ‘No Electricity Day’ on Friday 1 December. without it. The girls found it strange not being able to switch on lights or use the interactive whiteboards, but enlightening too as they did recognise how reliant everyone is on electricity. Year 1 wrote stories by “candlelight”, Year 2 learnt about the world using a giant map, rather than the IWB, and Early Years learnt the story of Christmas using puppets. The challenge going forward is to see how they can reduce their electricity consumption on an ongoing basis and perhaps chat, read and play board games, instead of relying on TV or the internet for entertainment. Congratulations to our Prep gymnasts on their impressive performances at the National ISGA 2 Piece Competition in Stamford. The audience at Thursday and Friday evening’s performances of “We Will Rock You” were rocking along with the cast and orchestra. It was a brilliant show with excellent acting, some great comedy, impressive singing and fabulous accompaniment by the school orchestra. Huge congratulations to the Expressive Arts Department on a fantastic production. 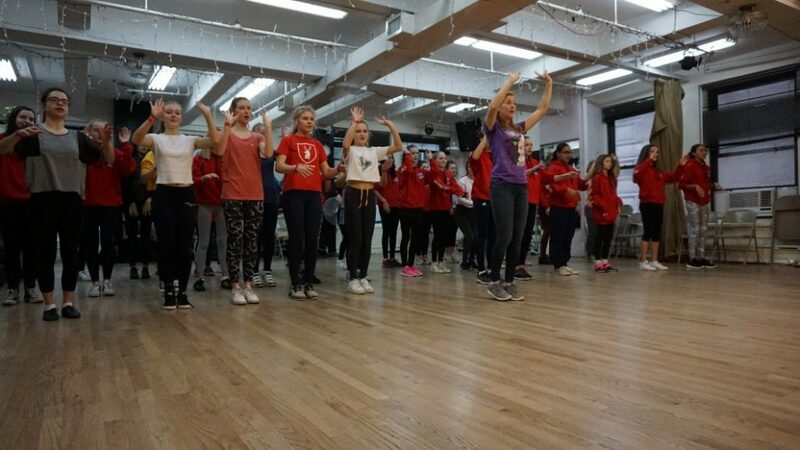 Over half term students from Years 7 – 11 enjoyed an Expressive Arts trip to New York. It was a wonderful experience for the girls who were able to see some of the world’s best performers in dance, drama and music as well as viewing some exclusive art work at the Metropolitan Museum of Art. 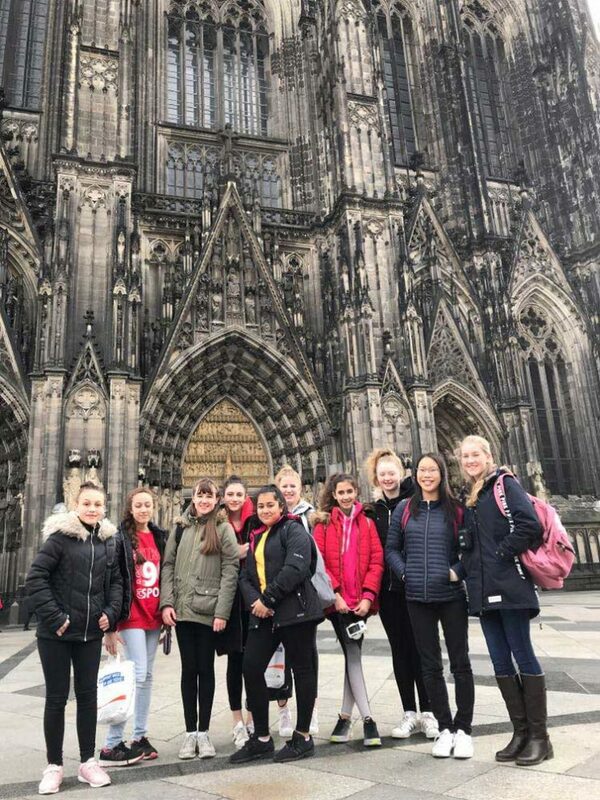 They also had time for plenty of sightseeing, taking in the key New York landmarks, including the Statue of Liberty, Times Square and Ground Zero. The girls sang in Trump Tower to a very appreciative audience and had a very engaging Broadway workshop, which was very useful in inspiring their artistic and performing aspirations and skills. 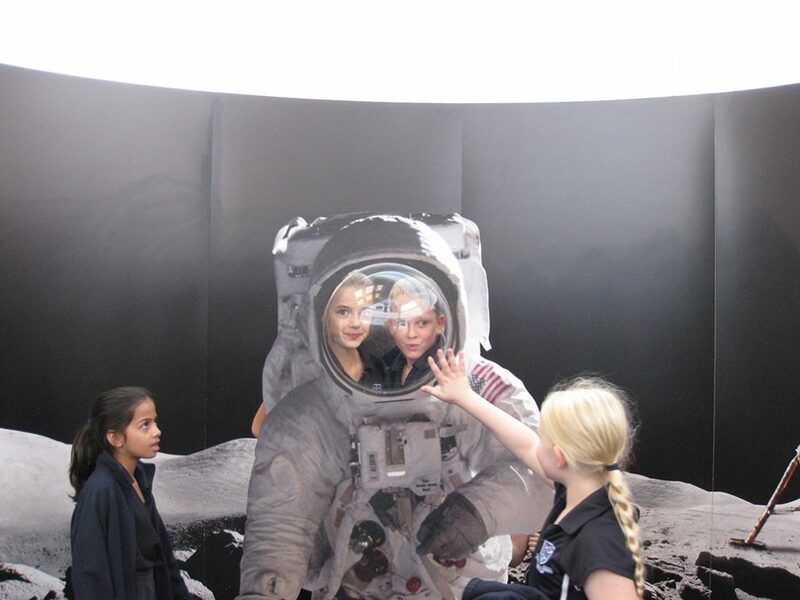 This week Years 5 and 6 were very excited to visit the National Space Centre in Leicester. On arrival at the exhibition they spent some time learning about how astronauts live in space and some fun facts about the planets. They then had an exciting presentation in the planetarium which focused on the training and dangers faced by astronauts. There was also a workshop where the girls learned about the various rovers which have landed on Mars, before using some software to program Lego NXT rovers to navigate rocks and find aliens (without running them over!). The trip finished with an elevator ride to the top of the rocket tower, passing by some huge space rockets and landing on the top floor to find out all about the first moon landing. It was a packed visit, both fascinating and great fun. 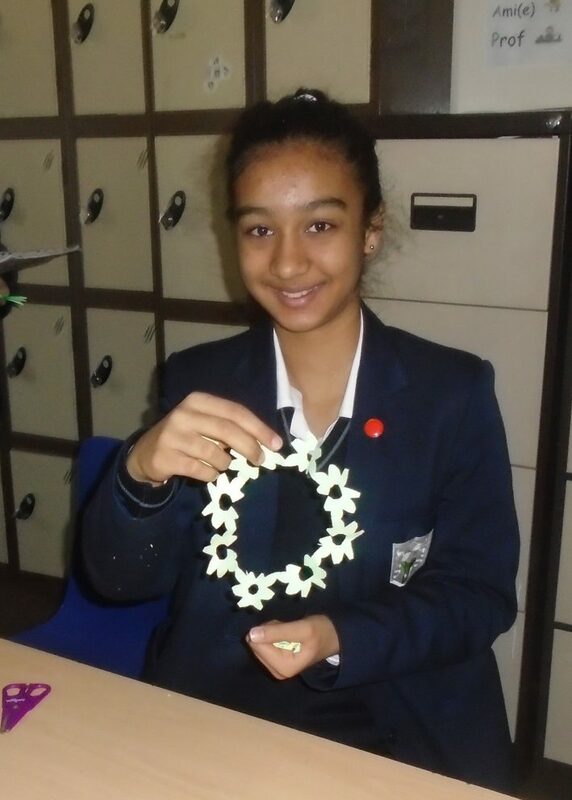 Our Year 7s had a great time last Friday on their Enterprise Day. The girls came dressed for business and were certainly in ‘professional mode’. In the morning they had to construct buildings out of newspapers, unfortunately only one of the buildings was sturdy enough to remain upright for any length of time, it was, nevertheless, a great exercise to build teamwork and get the girls thinking laterally. The next task was for each team to design a toy to capitalise on the Christmas sales market. 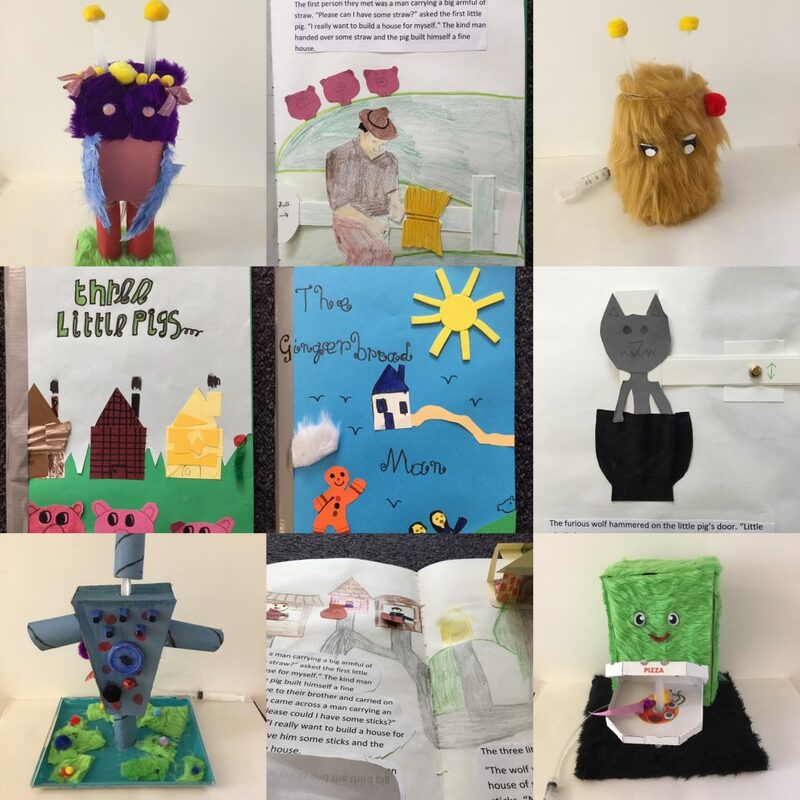 There were lots of ideas; a mobile phone specifically targeted at children, collectible toys and also a mixture of products based around the idea of slime. Once they had decided on the product the students then had to decide how to sell and advertise their product. At the end of the session the girls had to present their ideas and each and every one spoke to the whole group of Year 7 girls, fantastic experience in building confidence for public speaking. 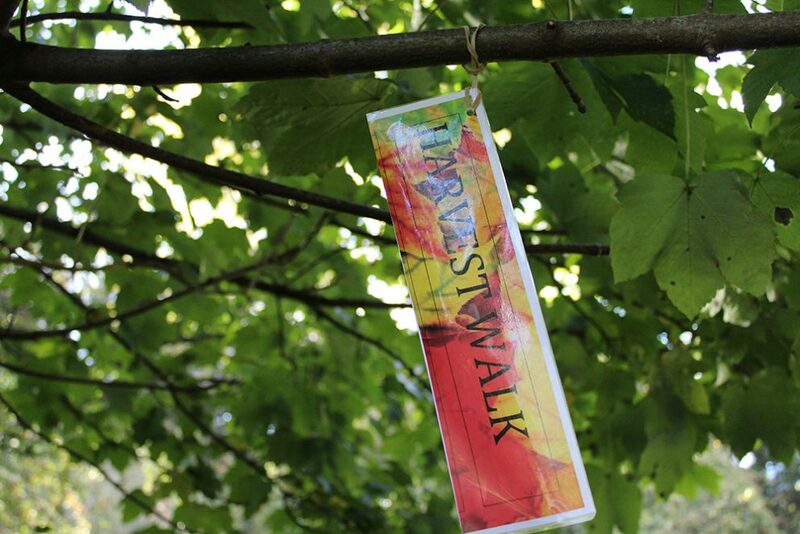 Girls from Years 6 to 13 took part in a 10km Harvest Walk on Tuesday 3 October to raise money. Money is being raised for two causes this year during Harvest time. RAHAB, Uganda to pay for five girls to go to school and Mulemi Community School Zambia, to raise funds to build classrooms and resources to use in the classrooms. All the girls completed the 10km walk cheerfully and in good time, trekking through Gerrards Cross, Chalfont St Peter and Chalfont St Giles, and back again. The girls from Nursery to Year 5 enjoyed a visit from the Zoo Labs. 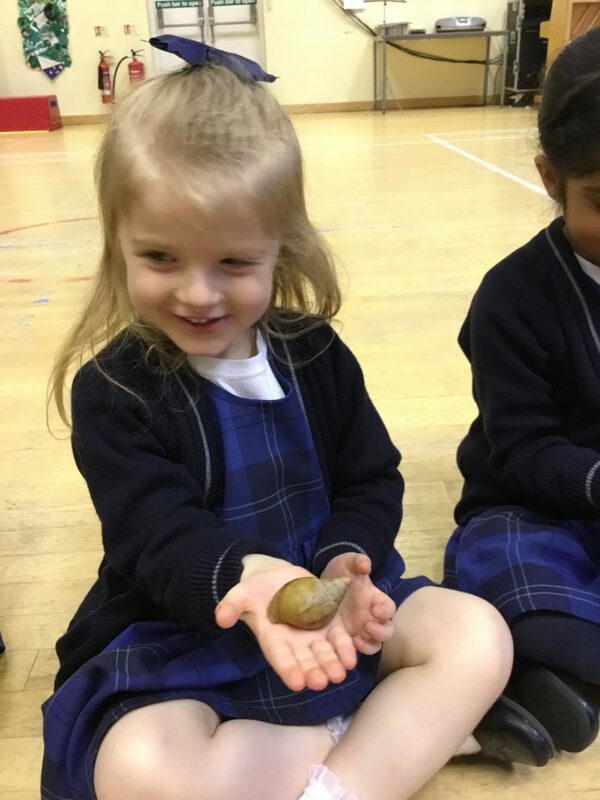 The girls learnt about the habitats of various animals including African snails, a jungle lizard, a snake and a tarantula! They were delighted to have the opportunity to hold them too and weren’t in the least bit scared! 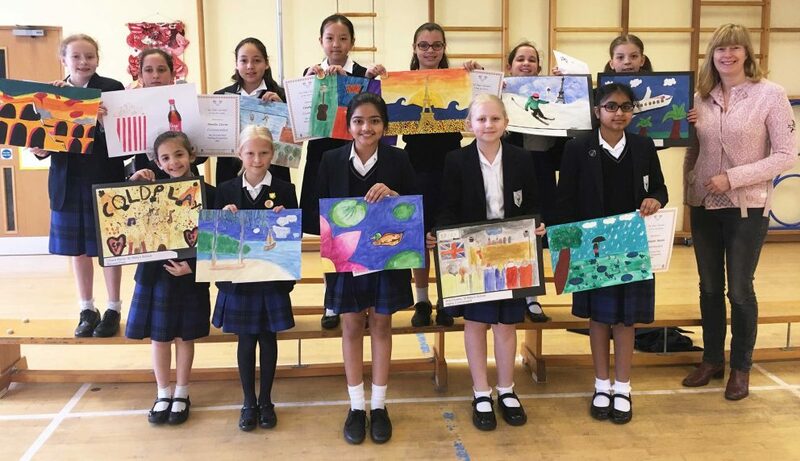 Our Year 5 and 6 girls were very successful in this year’s Chiltern Decorative and Fine Arts Society annual painting competition. Year 6 Sophie was the overall Gold winner! 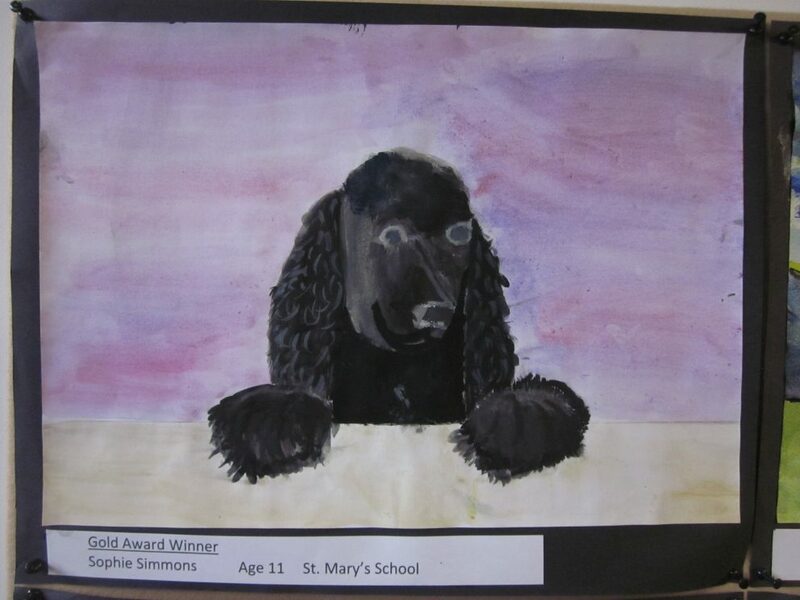 Year 6 Sophie was the overall Gold winner, with her charming portrait of her spaniel, Hope. Year 6 girls Daniela and Lucy were both highly commended and Maya in Year 5 was the School Prize winner. This week St Mary’s was filled with the wonderful aroma of baking as we had the House Bake Off competition. Over three evenings the competition became increasingly ‘heated’. 12 contestants entered the first round, which saw Chloe in Year 8 winning. This week St Mary’s School, Gerrards Cross, was filled with the wonderful aroma of baking as we had the House Bake Off competition. Over three evenings the competition became increasingly ‘heated’. 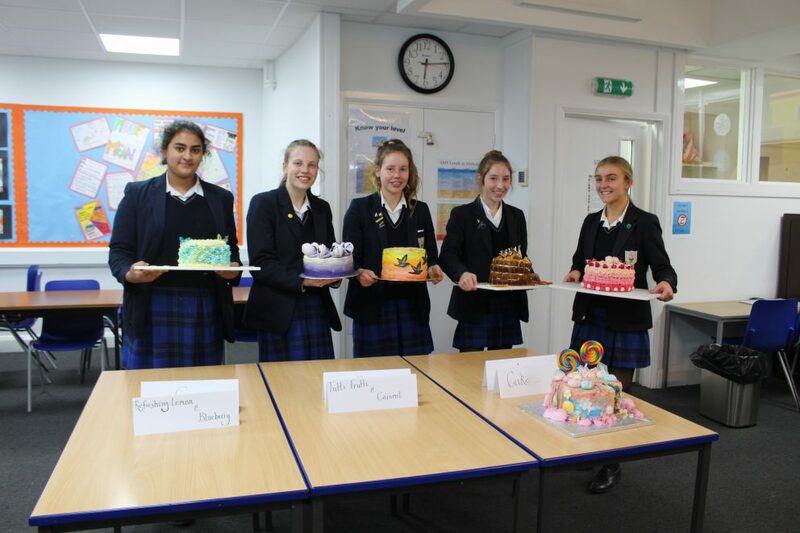 12 contestants entered the first round, which saw Chloe in Year 8 winning ‘Star Baker’ and an honourable mention for Priya Year 8 and Simran Year 12 for their beautiful decorations. spotlight. Special mention was also given to Freya for her presentation idea and Orla for creating a lovely pastry heart. The six girls who went through to the final round to face the Swiss Roll challenge were Riya, Freya, Aman, Simran, Amy and Salma. The judges for the final were two of our Governors, Nick Moss and Christine Bayliss, who had the very difficult task of choosing the winner of our first ever Bake Off – it was so difficult that they even had to have second helpings! Standards were high as they tested the lightness of the sponge, the shape of the swirl, the flavour and presentation – special mention goes to Simran Year 12 who, despite it not going so well on the day, had luckily made a perfect example of a Swiss Roll earlier, so all was not lost! Amy, Year 12 and Salma, Year 9 both managed to create a fantastic swirl and scored highly for the shape and flavour! The Star Baker and overall winner was , however, Riya in Year 9 from Latham. Well done to all of the girls who participated. Daniella had 7 inches chopped off that she then donated to The Little Princess Trust. real hair wigs free of charge to boys and girls across the UK and Ireland that have sadly lost their own hair due to cancer treatment and other illnesses. St Mary's School, Gerrards Cross has a newly formed ukulele club. It is run by a talented Ukulele player in Year 10, Izzy, and the group has already learnt two songs after only two sessions! two sessions! The girls particularly enjoyed playing and singing along to Emeli Sande’s ‘Next to Me’ and in the next session they will be attempting ‘Let it Be’ by the Beatles! grades. History, which switched to the IGCSE this year achieved 75% A*/A. St. Mary’s School, Gerrards Cross achieved a very impressive set of A-Level results again this year. 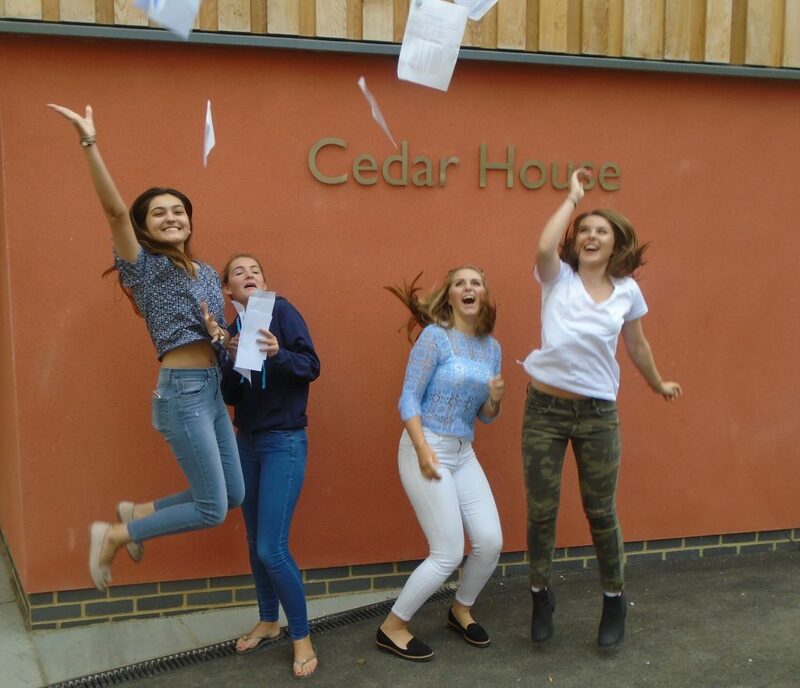 With a 100% pass rate and 82% of results graded at A* to C there was good cause for celebration. St. Mary’s School, Gerrards Cross achieved a very impressive set of A-Level results again this year. With a 100% pass rate and 82% of results graded at A* to C there was good cause for celebration. 61% of the overall grades were A*- B and nearly half of all the girls gained A* – B grades for all of their subjects. French, German, Art and Design and Physics all recorded 100% A* – B grades. 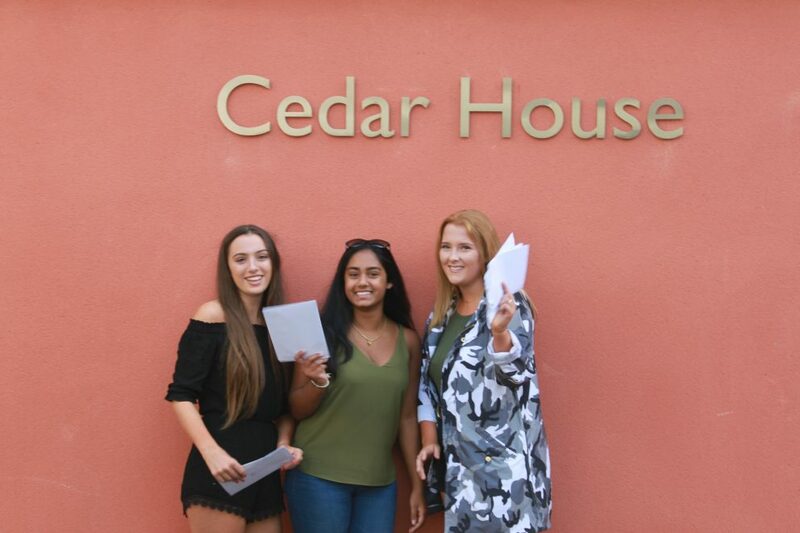 projects again being awarded A* or A and the AS Level results were also very strong with 77% graded A*- B.
Headmistress Mrs Ross commented “We are once again delighted with the fantastic results that our girls have achieved. 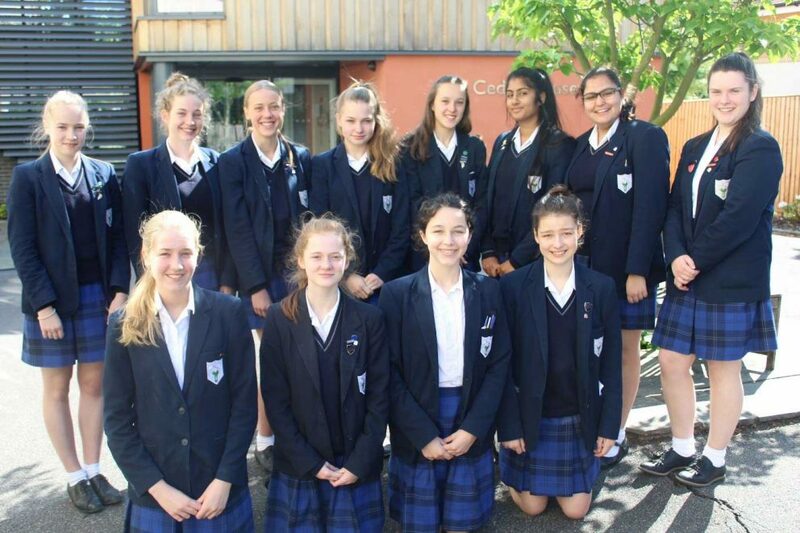 From those who have achieved a full complement of top grades to girls who have worked hard to achieve grades better than they had ever expected, we are proud of all of their achievements. We wish them all continued success as they move on to their chosen universities”. St Mary's, Gerrards Cross pupil Scarlett Carroll in Year 4 has won the UK Rotary Poem Competition for The Queen's 90th Birthday celebrations. Her poem was royally despatched to Windsor Castle, included in a birthday card to Her Majesty. 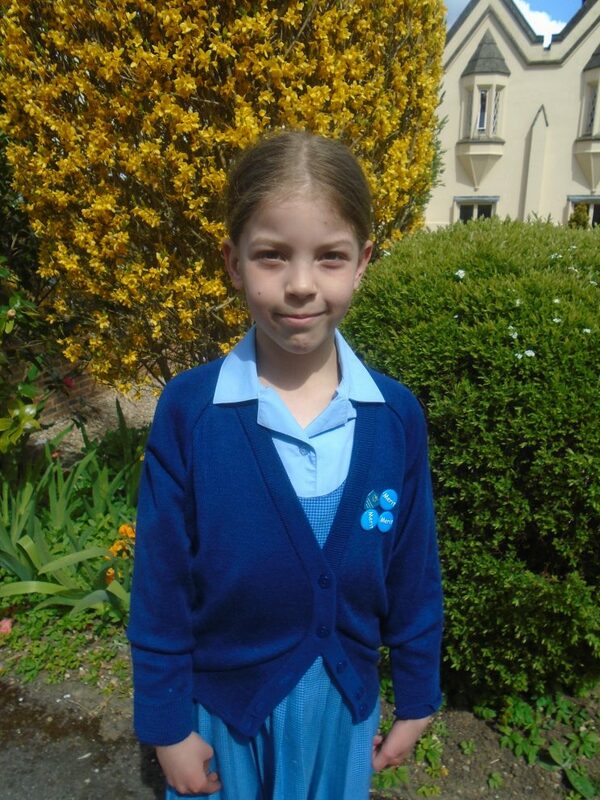 St. Mary’s, Gerrards Cross pupil Scarlett Carroll in Year 4 has won the UK Rotary Poem Competition for The Queen’s 90th Birthday celebrations. Her poem was royally despatched to Windsor Castle, included in a birthday card to Her Majesty. And make an awful mess! And the corgis’ aren’t a pest! Last Friday our Prep Department once again held the immensely popular Grandparents/Special Older Person's Tea. and impress them with their singing and musical talents, whilst the guests enjoyed their afternoon tea. With nearly 80 guests it was a very popular event and great fun for the girls as well as our visitors! 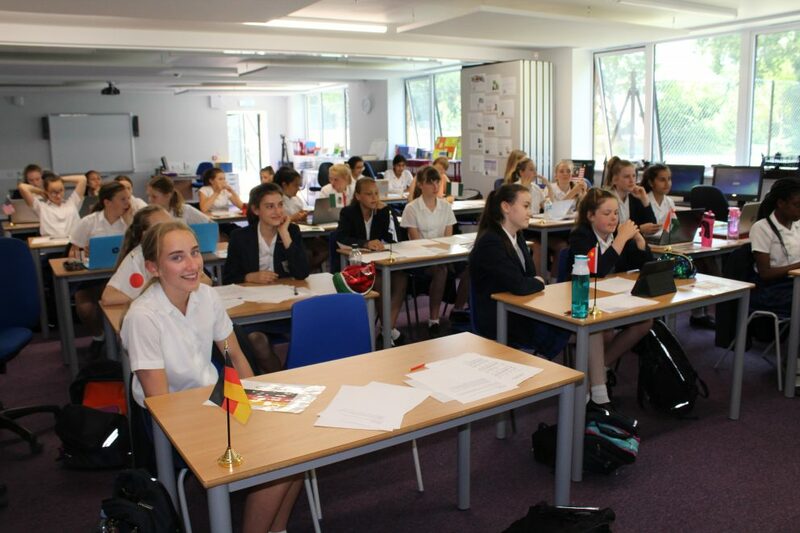 There has been great excitement at St Mary's School as a selection of our Senior House girls embraced technology to commence lessons in Mandarin. Using Skype, the girls linked directly to Beijing and their Chinese teacher May. There has been great excitement at St Mary’s School as a selection of our Senior House girls embraced technology to commence lessons in Mandarin. Using Skype, the girls linked directly to Beijing and their Chinese teacher May. Lessons were very interactive, covering an introduction to the language, the 5 Chinese tones, which are vital to develop speaking skills and understanding of spoken Mandarin, and the Chinese Han characters – more specifically the point of them, they are, in fact, the oldest continuously used system of writing in the world and are among the most widely adopted writing systems in the world. Additionally, the girls’ creative skills were used to learn the art of Chinese paper cutting also named Jianzhi (?? ), to make pretty paper flower circles. A flavour of life in China and Beijing, with videos and pictures of the country as well as a real-time view of the city outside May’s office were also included. After the trial ended, the consensus was that the girls had thoroughly enjoyed the lessons and had learnt some useful basics as an introduction to the language and culture. The girls all receive a Chinese achievement award, which is in the same style as awards that are given out for achievement in Chinese schools. 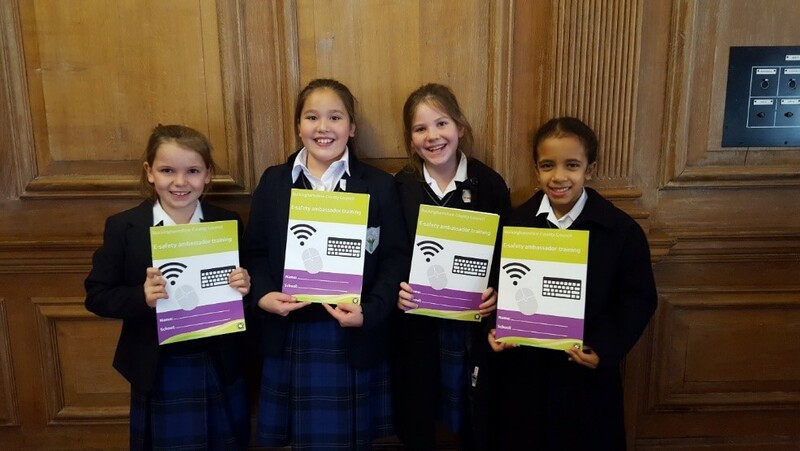 Congratulations to all our Prep girls who entered the Rotary Club's ICT and Poetry competition. Evangeline in Year 5 won 1st prize in the Year 5 category, whilst Year 3 Serene was awarded 2nd prize in the Year 3 category. prize in the Year 3 category. Year 4 pupil Scarlett won 1st prize at local level in the Rotary Young Writers competition for her poem for the Queen’s 90th Birthday. Her entry has now been submitted to district level. On Monday 7 December, thirty five members of Senior Choir visited the Leonard Cheshire Home to sing Christmas songs. percussion instruments. The girls enjoyed a drink of juice, and a biscuit, before walking back to school. A very worthwhile trip to spread a little Christmas Cheer leading up to the end of term. Great singing, girls! 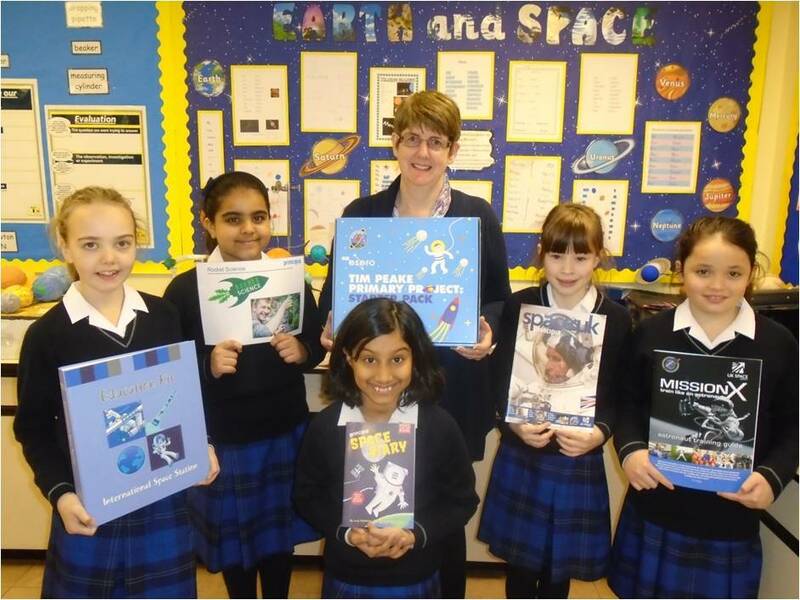 After the excitement of yesterday's launch, the Prep girls at St Mary's are preparing to become space biologists and embark on a voyage of discovery by growing seeds that have been into space. After the excitement of yesterday’s launch, the Prep girls at St Mary’s are preparing to become space biologists and embark on a voyage of discovery by growing seeds that have been into space. In September, 2kg of rocket seeds were flown to the International Space Station (ISS) on Soyuz 44S where they will spend several months in microgravity before returning to Earth in March 2016. The seeds have been sent as part of Rocket Science, an educational project launched by the RHS Campaign for School Gardening and the UK Space Agency. St. Mary’s will be one of up to 10,000 schools to receive a packet of 100 seeds from space, which they will grow alongside seeds that haven’t been to space and measure the differences over seven weeks. The girls will not know which seed packet contains which seeds until all results have been collected by the RHS Campaign for School Gardening and analysed by professional biostatisticians. The out-of-this-world, nationwide science experiment will enable the girls to think more about how we could preserve human life on another planet in the future, what astronauts need to survive long-term missions in space and the difficulties surrounding growing fresh food in challenging climates. Rocket Science is just one educational project from a programme developed by the UK Space Agency to celebrate British ESA astronaut Tim Peake’s Principia mission to the ISS and inspire young people to look into careers in STEM (science, technology, engineering and maths) subjects, including horticulture. St. Mary’s will be taking part in some of the other investigations linked to this project including completing Space Diaries that follow Tim Peake’s Principia mission month by month.